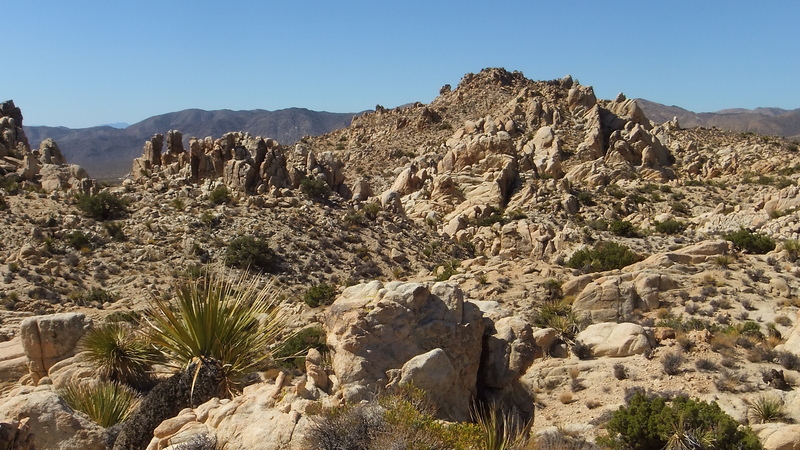 ONCE COOL CONDITIONS RETURNED to Joshua Tree National Park in the early autumn, I chose what would turn out to be a lovely Sunday in September to continue exploring the rugged Uncertain Hills at Towers of U. 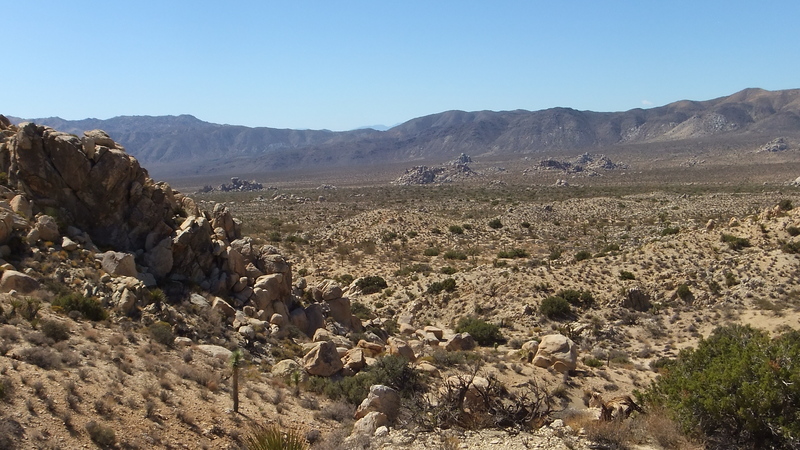 The usual parking area, Stop 2 on the Geology Tour Road, was already occupied. 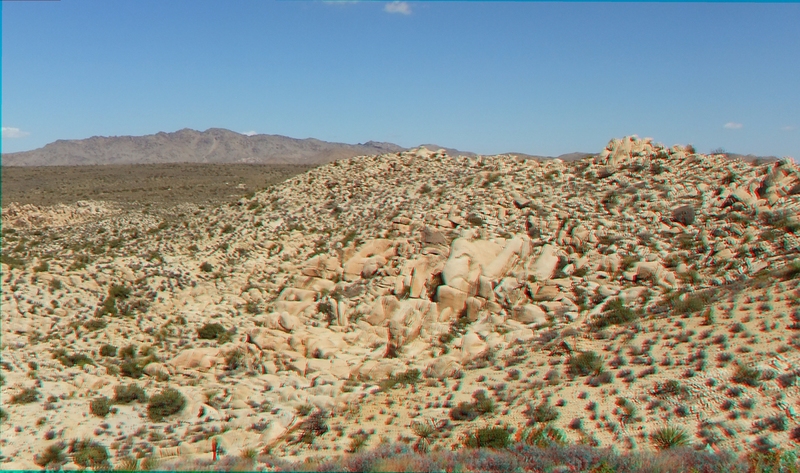 With room for 6 cars, a single auto had taken “my” favored spot on the left. 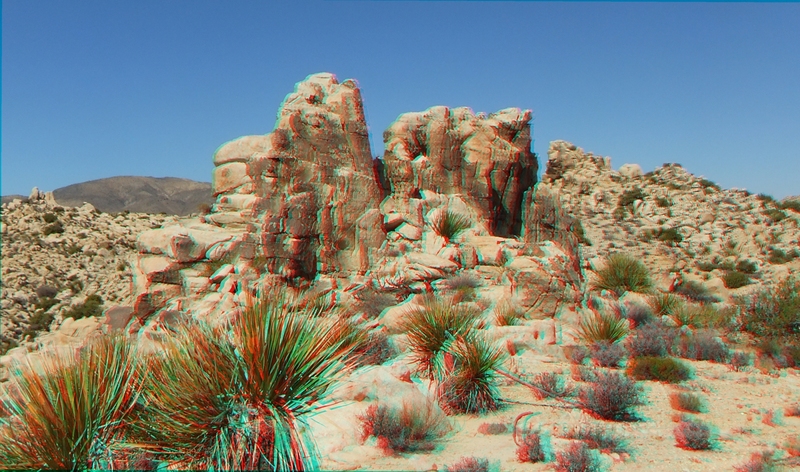 Sinister. 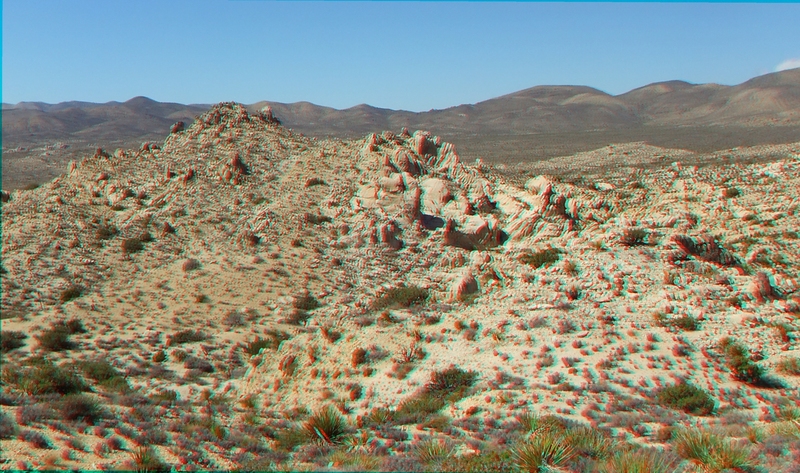 Therefore, I nosed into the more honorable dexter side, or right-hand slot. 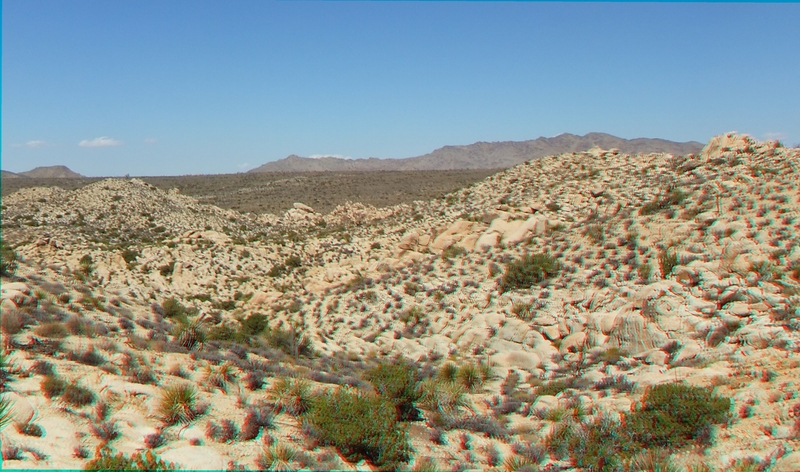 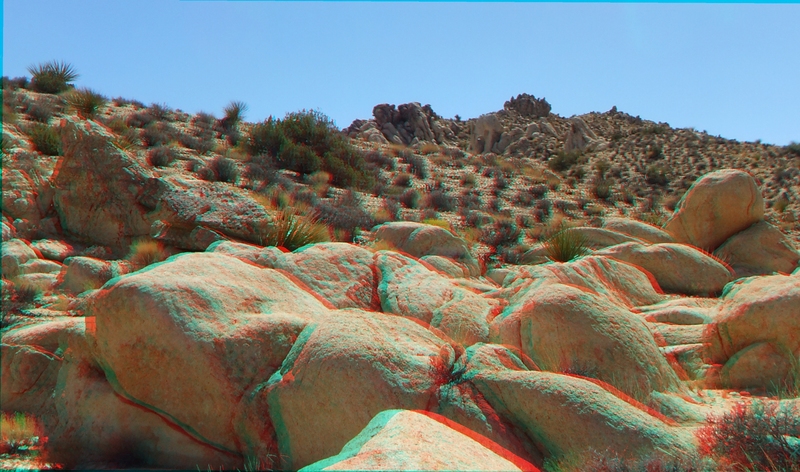 WITHIN THE HILLS, having traversed the wash on the eastern side approach, I arrived at the main formations and began 3D picture-taking. 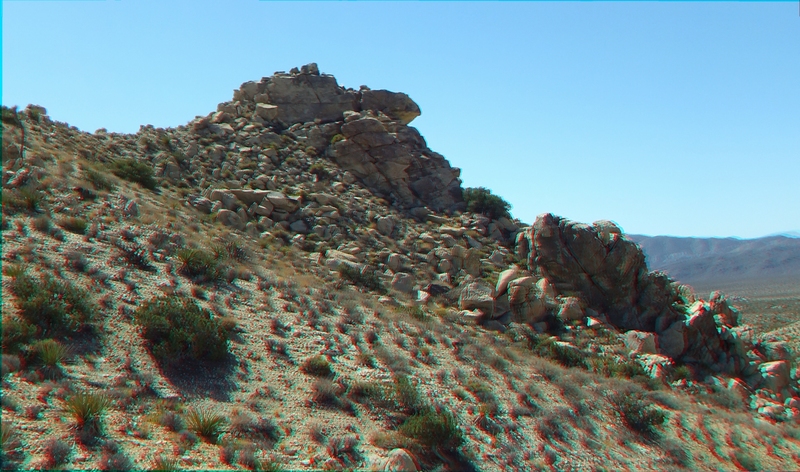 My original intent was to do the crest along the interesting-looking southern hill out of which sticks Table-top rock. 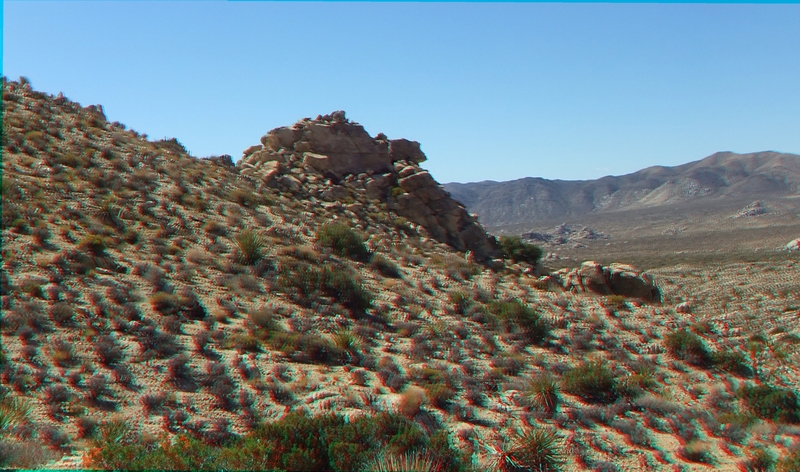 However, once I began moving through the formations at a snail’s pace, I decided to leave the crest for another time. 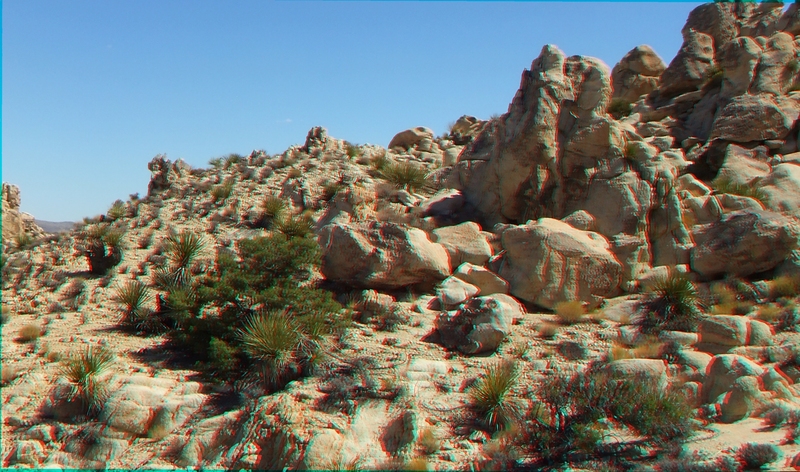 The 3D views from the hilltop will be, I am sure, worth the wait. 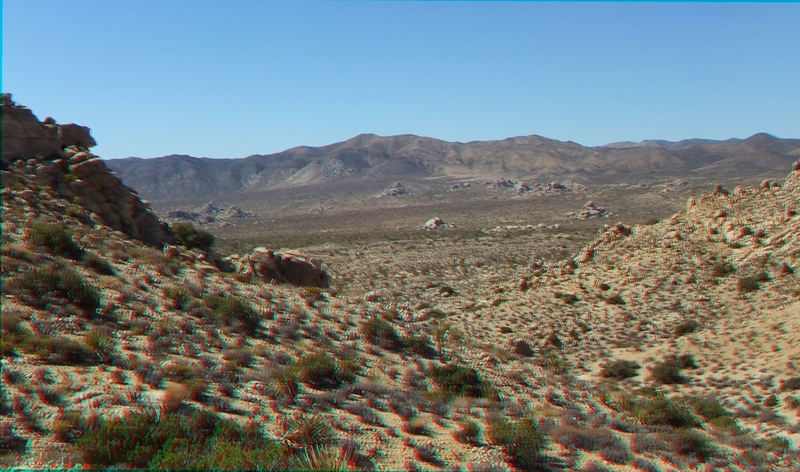 This day I found the same serene, surreal conditions as before. 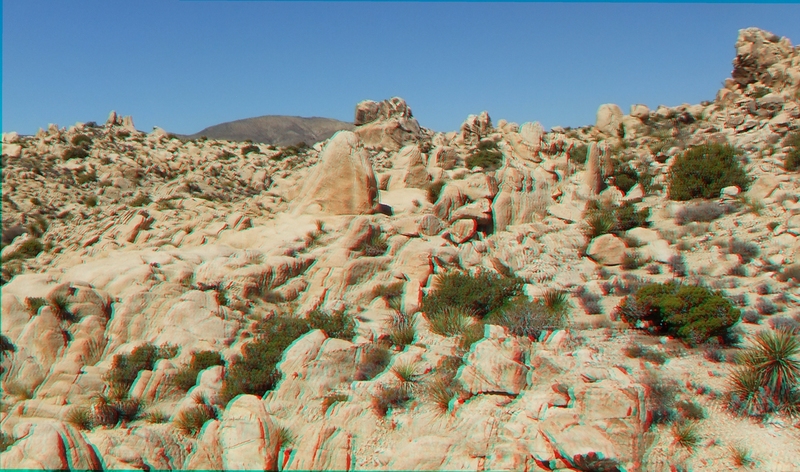 Which is the reason I had been patient for six months. 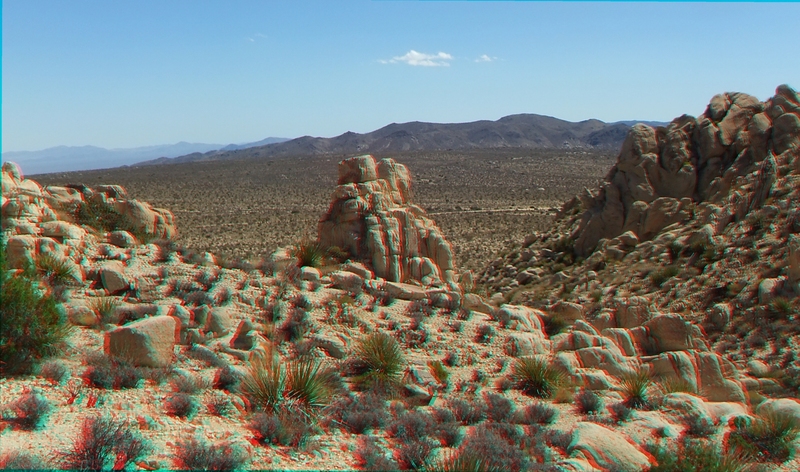 Conditions would not allow it. 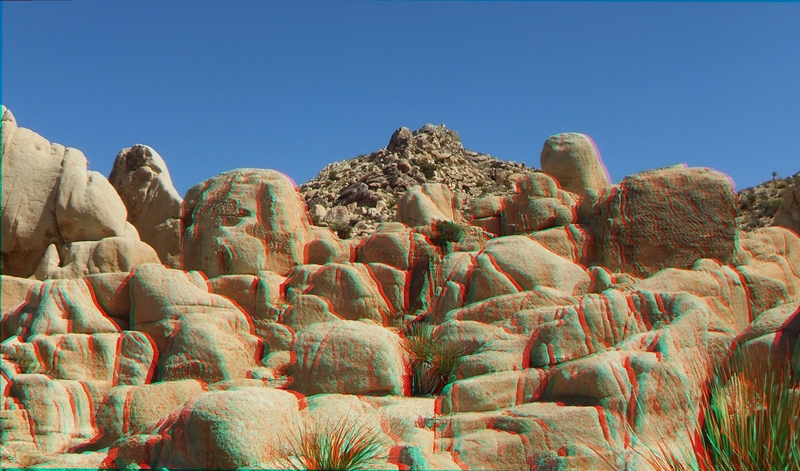 Hot summer days at Joshua Tree aren’t to my liking. 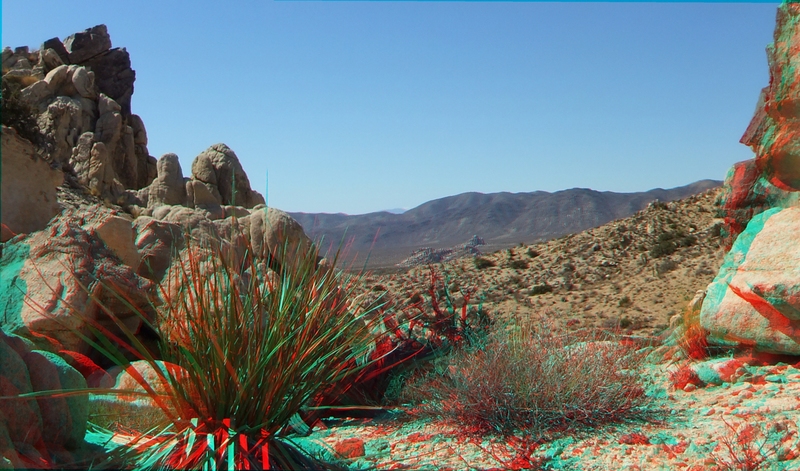 Even on a winter’s day, I go through a gallon or gallon-and-a-half of water. 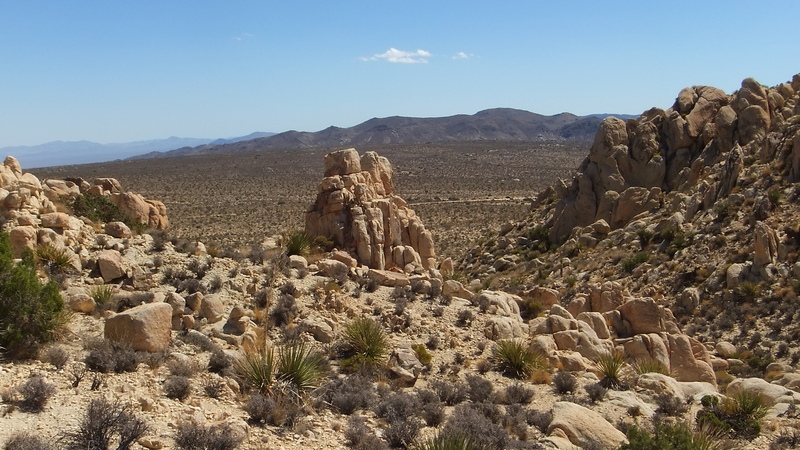 Mad-dogs or no, in summer, with no shade to speak of at Towers of Uncertainty until late afternoon, it would take an Englishman to go out in the Park’s noonday sun! 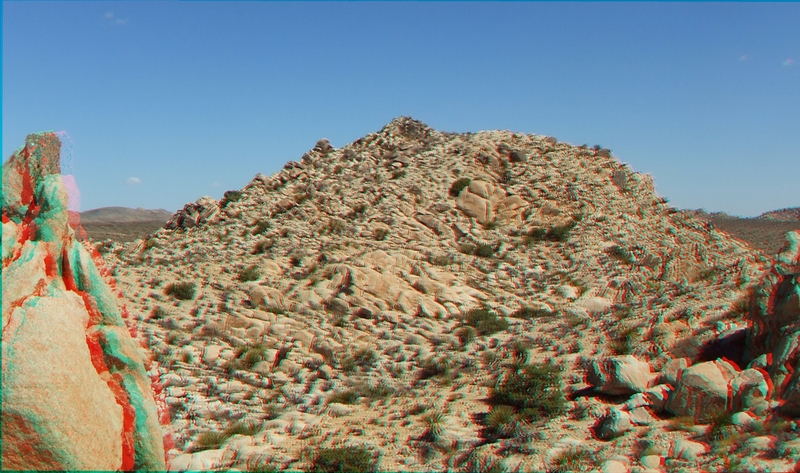 THE THREE FOCI, or main centers of attraction on which 3D-Murbachi had chosen to concentrate today, were: (1) a small double hill with a “saddle” betwixt and between, topped with dark knife-sharp spires, (2) a magnificent little 145ft high hill punctuated by any number of monzogranite bumps and nodules and doodads and whatsits, and (3) some more of my favorite Dr. Seuss formations tucked back in a gully. 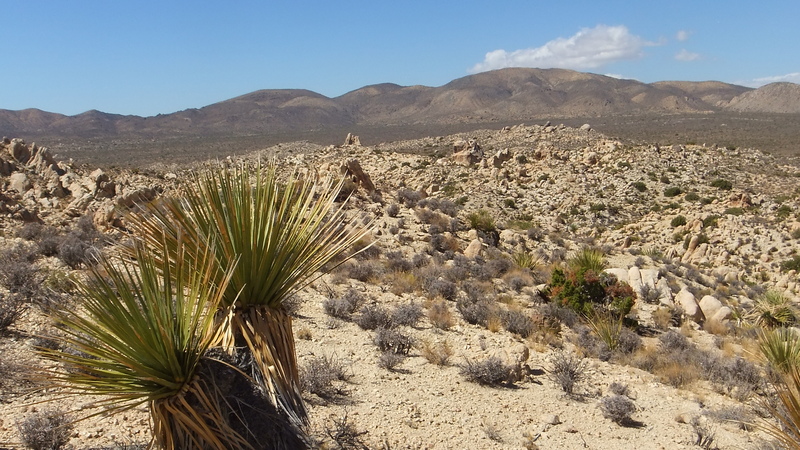 Each, from my previous experience at the Central and Western areas of this hill country, suggested many camera angles and endless new & fanciful combinations of plants and rocks, rolling landscape against blue Western skies. 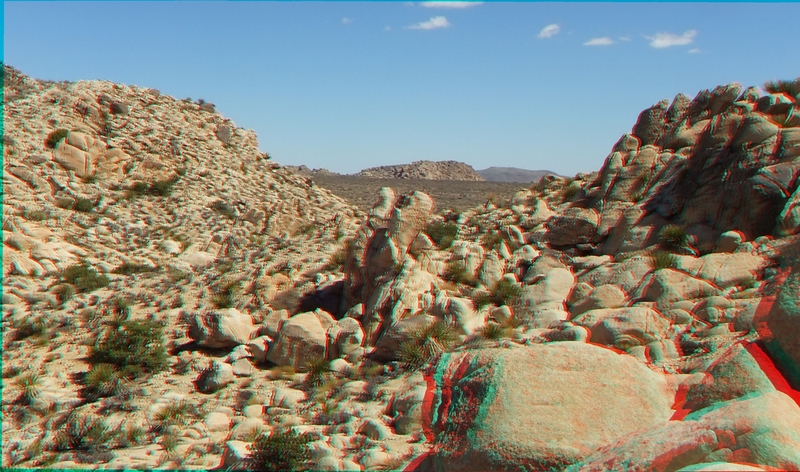 And you know? 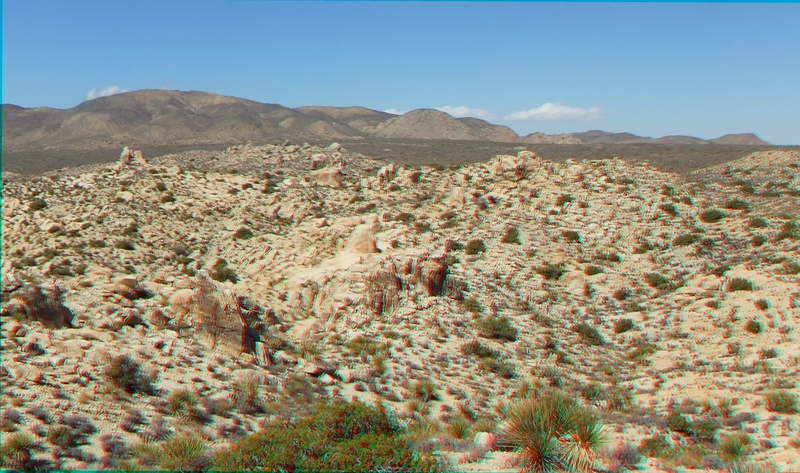 Turned out to be exactly that! 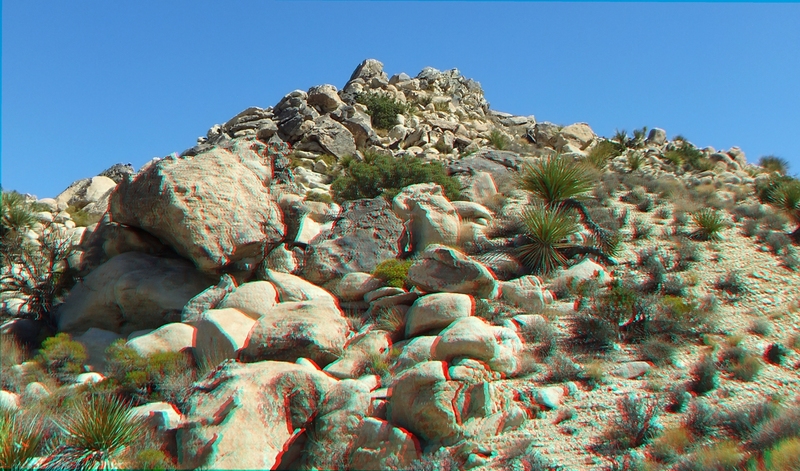 FYI—that’s short-hand for For Your Information—FYI, this day’s 3D photojournal consists of 800-and-two individuool shots and even a couple of minor video clips. 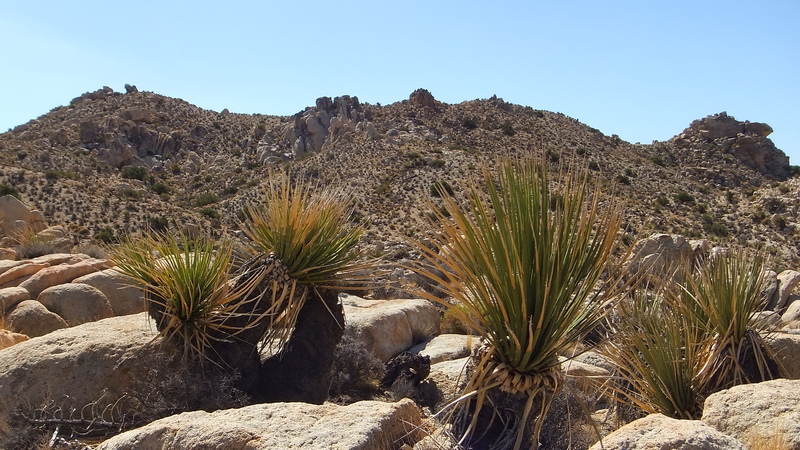 (The videos are of some beargrass-looking nolinas shivering in the breeze. 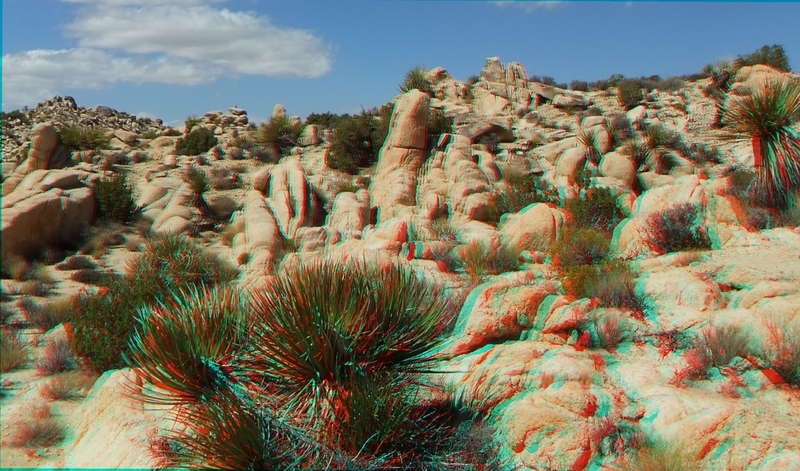 Shivering in 3D.) 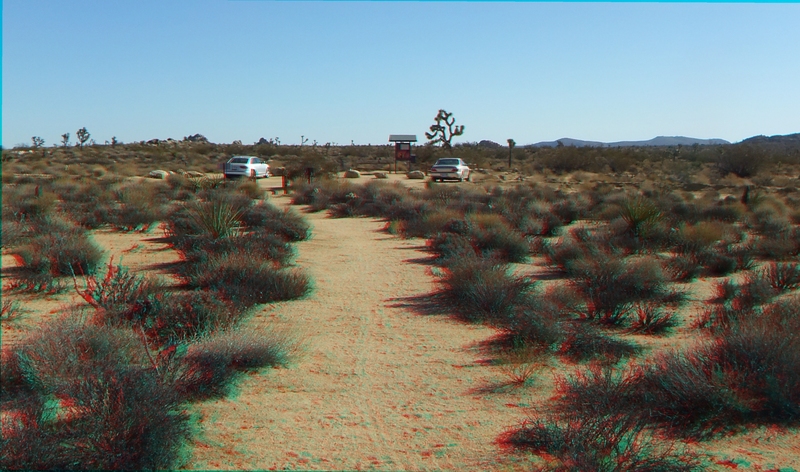 Now that many 3Ds, if I tried to lay them out on a single page would surely make your browser’s cache choke, or your computer’s hard drive buzz, or your random-access-memory fry. 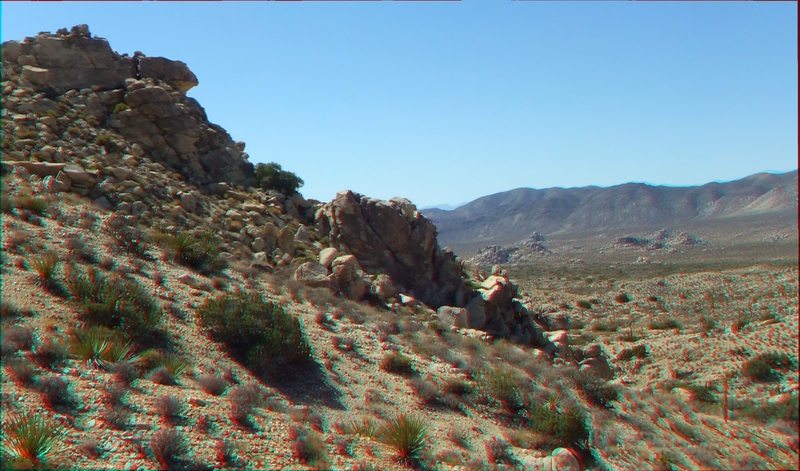 So I’ve shaved them way back into a decent but still full-calorie American-sized meal. 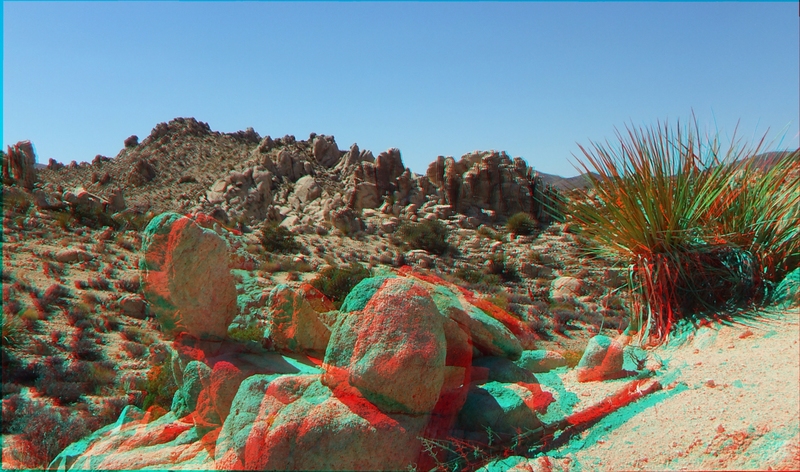 What you see on this page is merely a snapshot. 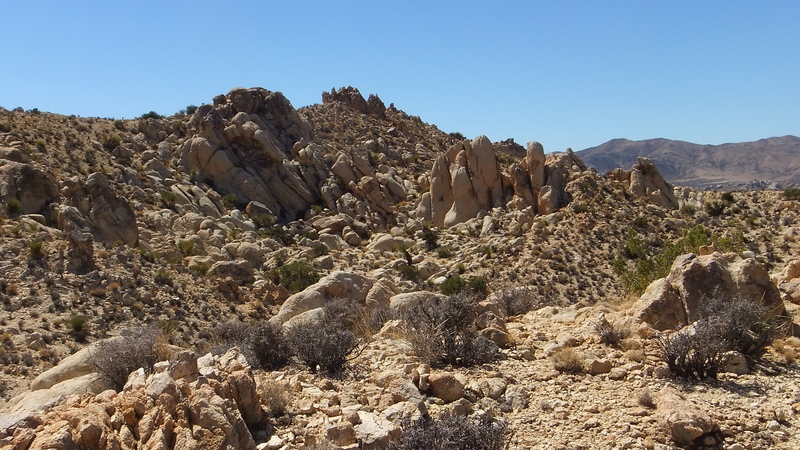 Ask me about getting others. 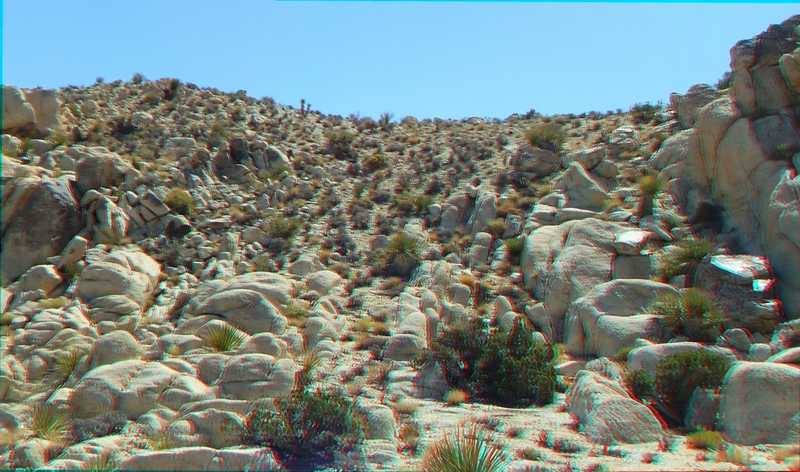 If you want to see them. 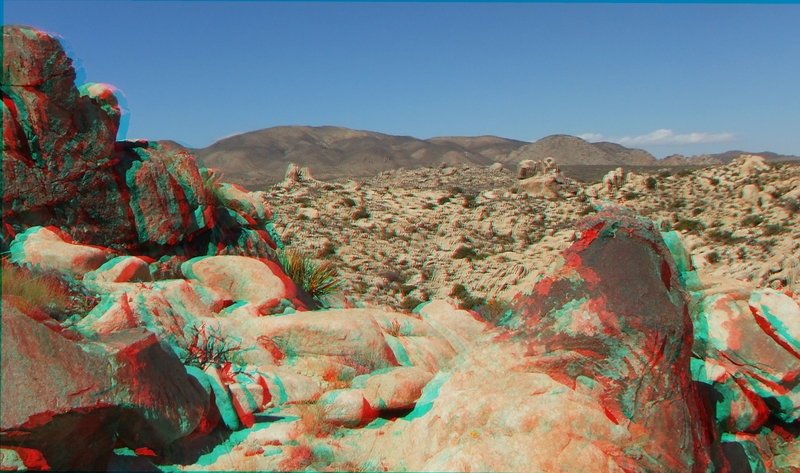 We’ll work something out. 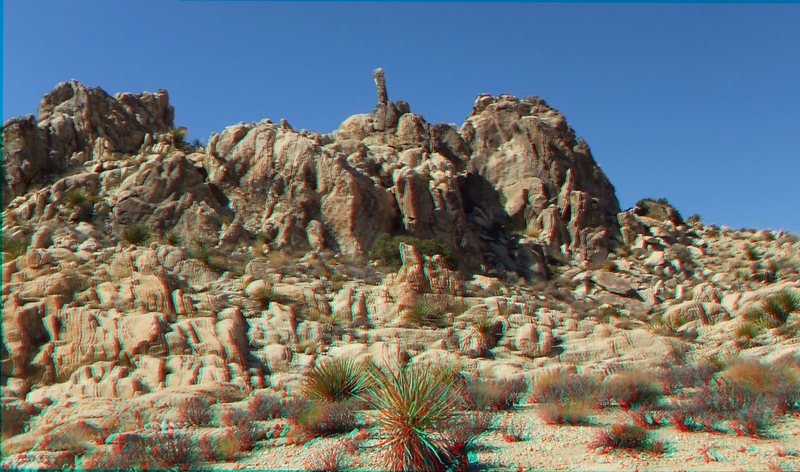 Just the 1080p 3D Half Side-by-Side set of 802 pictures runs 1.2 gigabytes. 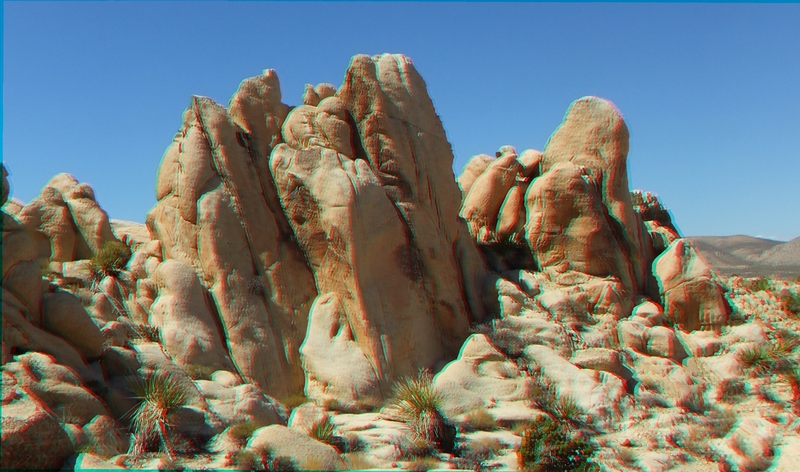 The 2Ds, 3D anaglyphs, 3D 2016p H-SBSs, will add on another few hundred calories. 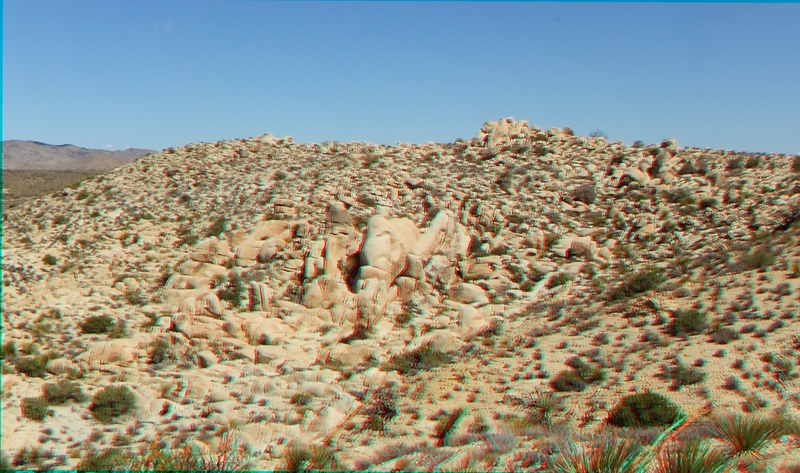 THIS PAIR OF SMALL MOUNDS—with its saddle and plenty of rocks to sit on—would make an idyllic stopping point for a snack. 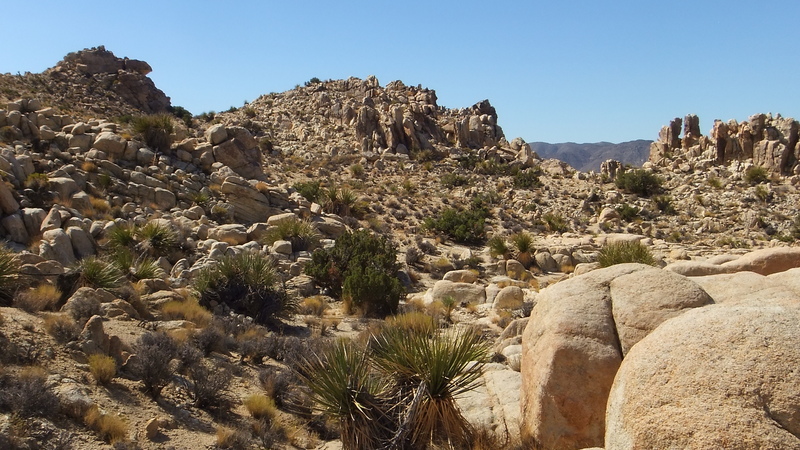 An area in which to enjoy some quiet zen relaxation. 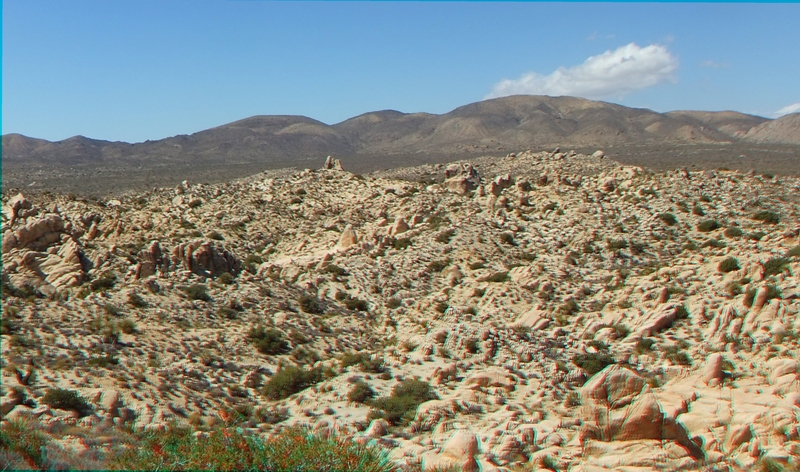 However, duty calls and so onward and upward I went. 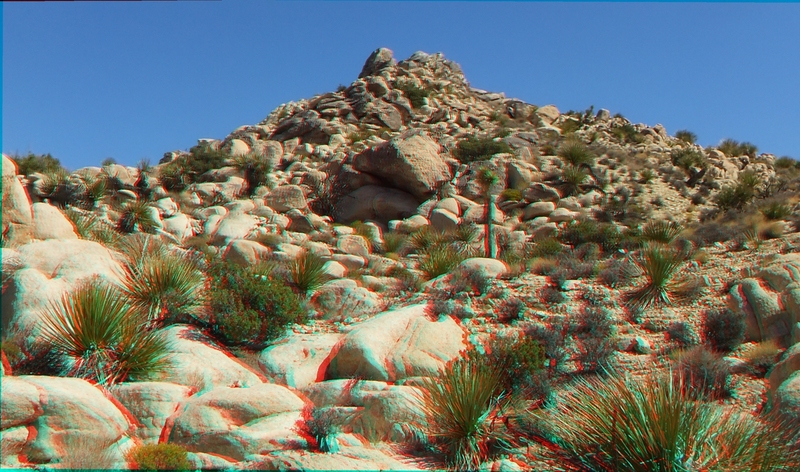 ONCE DONE “UP THAR,” there are any number of ways to go. 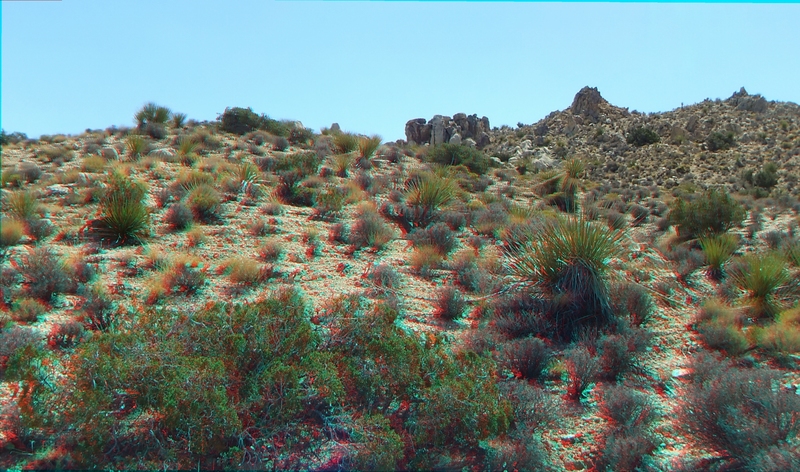 I chose a route into the gap in the hills, and took a few pictures toward Crown Prince Lookout two miles away. 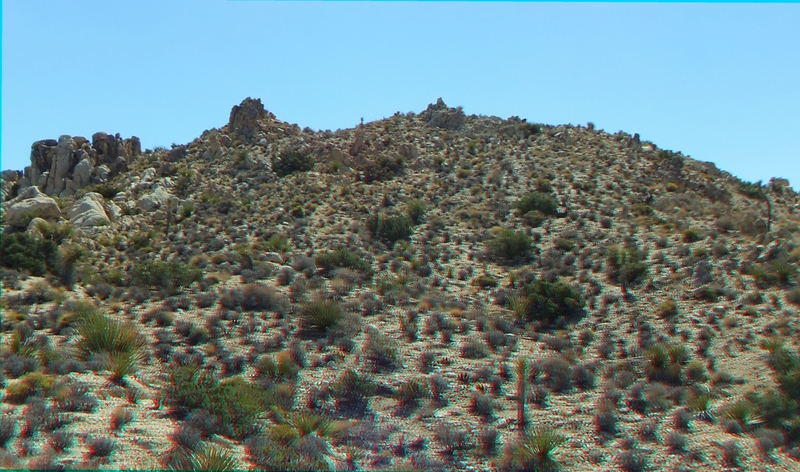 Following that pleasant diversion, I found an adjacent hill and took video of some nolinas wiggling in the breeze from up there. 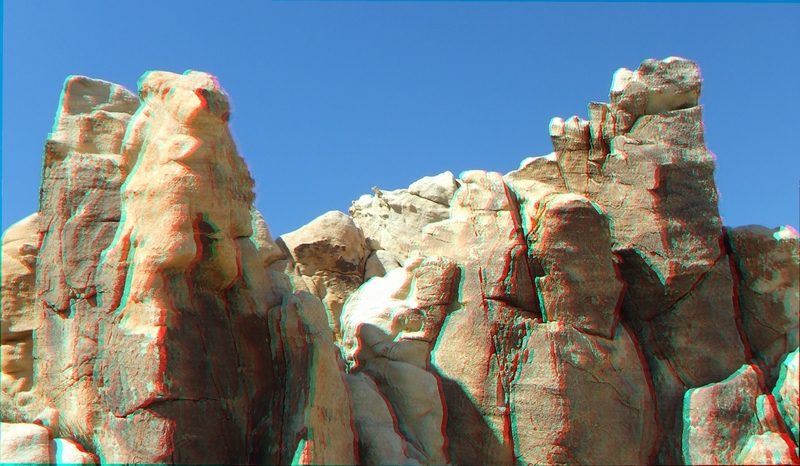 Satisfied I had gotten all the distance shots that were worth taking, I left the hill behind and zig-zagged down into “Back This-a-Way”—the Dr. Seuss fantasyland which you read about earlier and which you will find a gallery for after this pleasant Interlude. 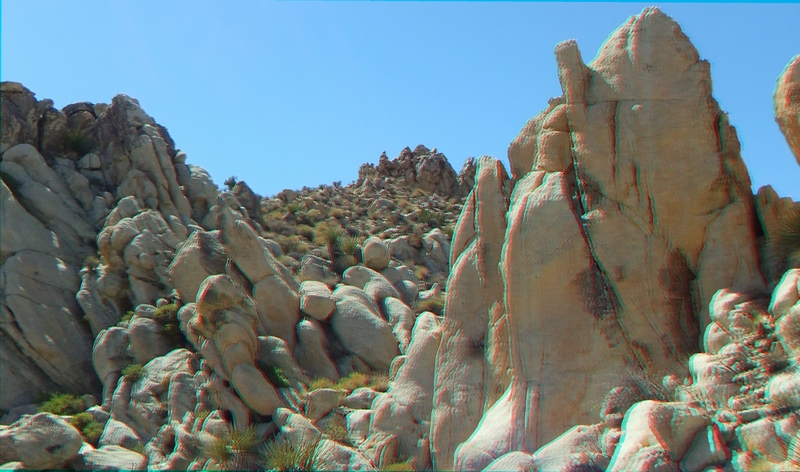 Thank you for your most patient patronage! 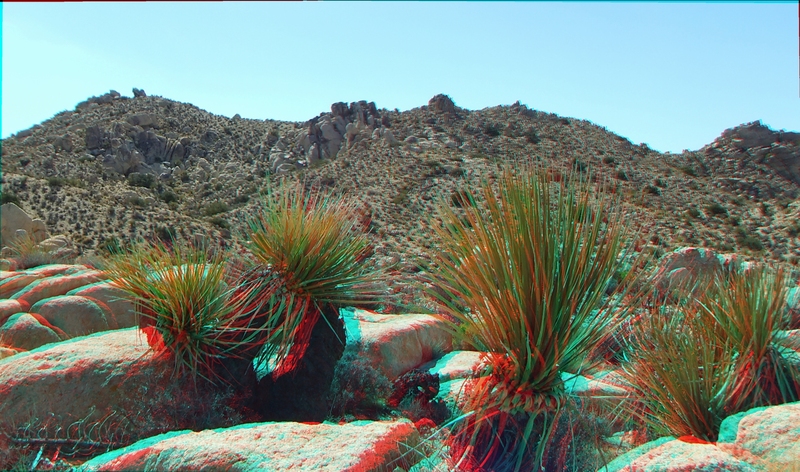 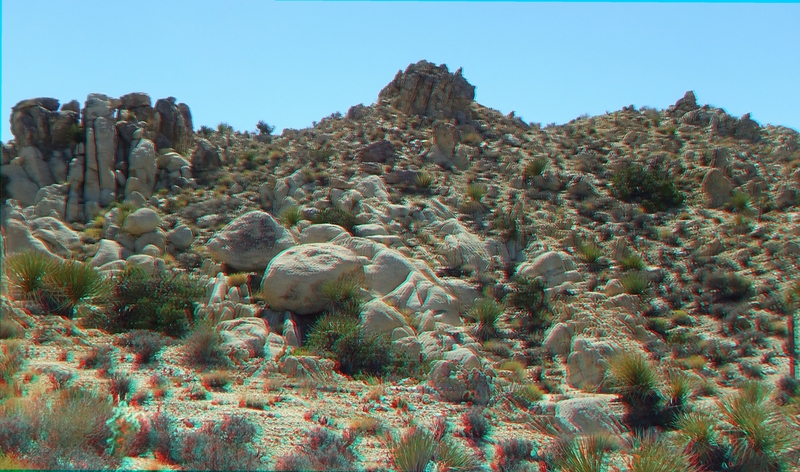 SOME JUNIPER BUSHES, nolinas by the score like confetti sprinkled around, needle-sharp cacti, black bushes, and other desert flora—in among the rocks— this is what the 3D camera finds. 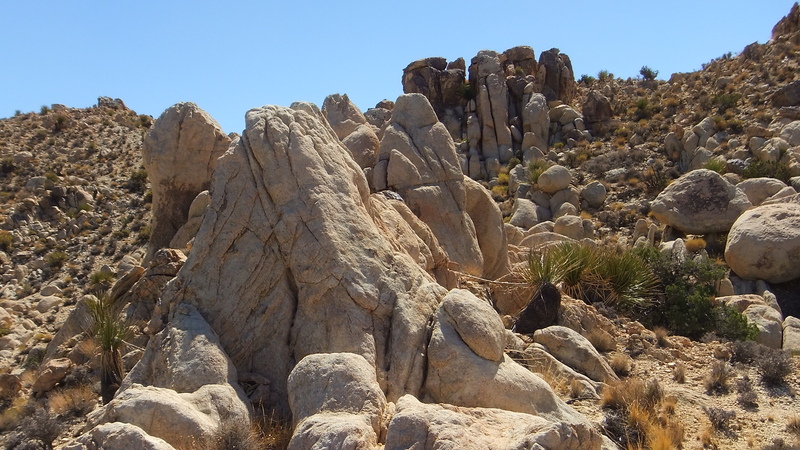 Lots to see, the nooks and crannies hide many secrets. 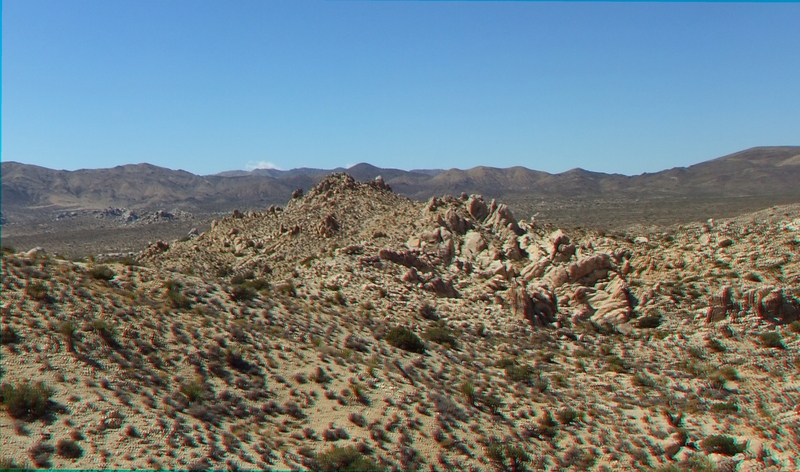 And all set against a beautiful rolling high desert Joshua Tree landscape, the hills at Towers of Uncertainty. 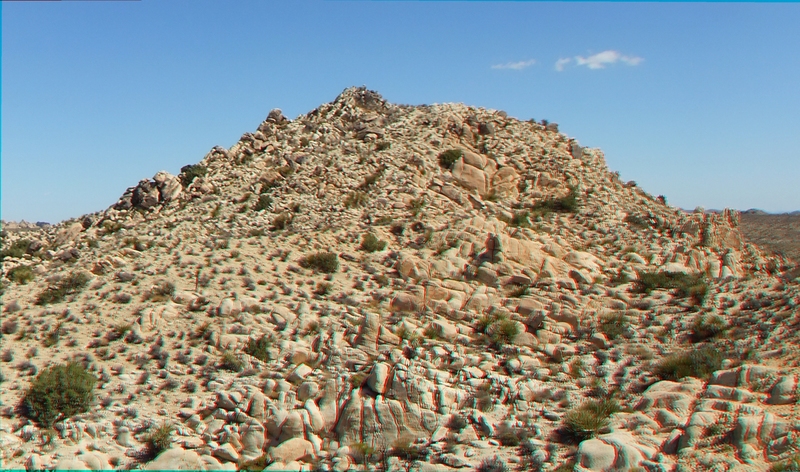 Elevation is 4400 to 4500ft above sea level. 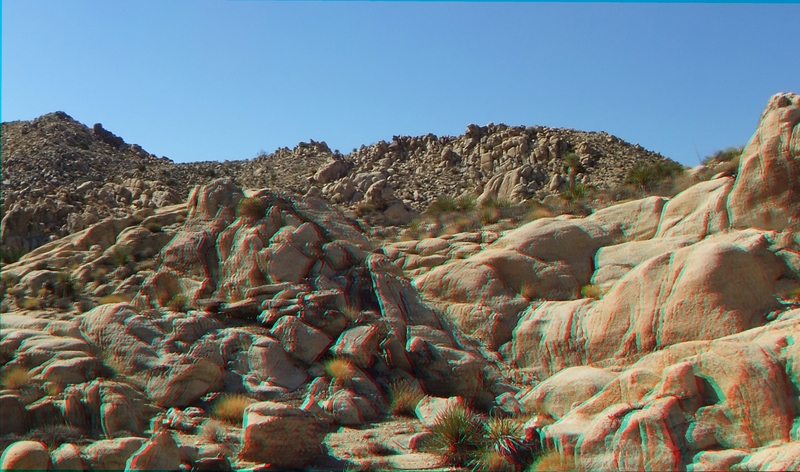 CAN’T FIND IT? 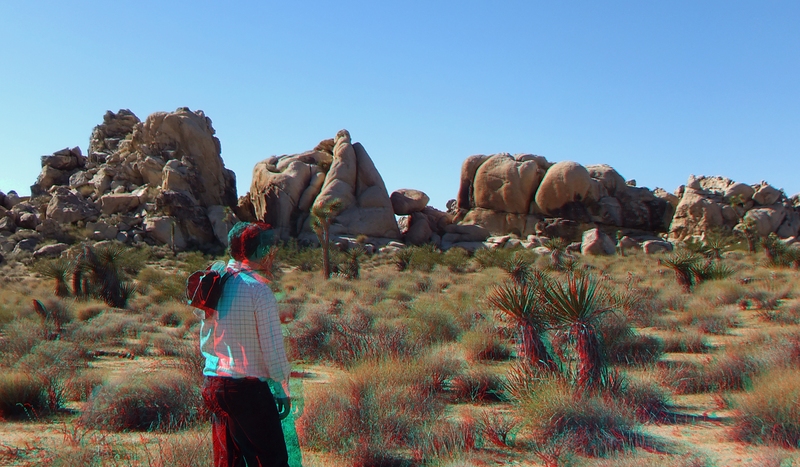 Don’t Panic! 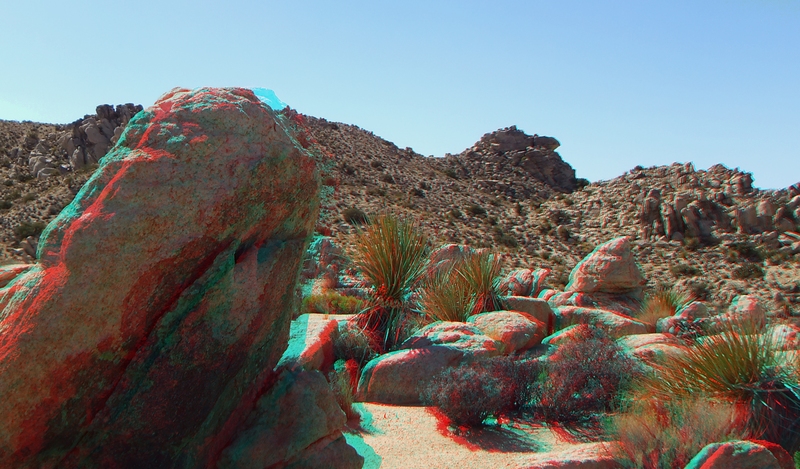 Simply press the magic button with you pointer, and you will be whisked away to Another Page wherein will be found the desirable 3D H-SBSs. 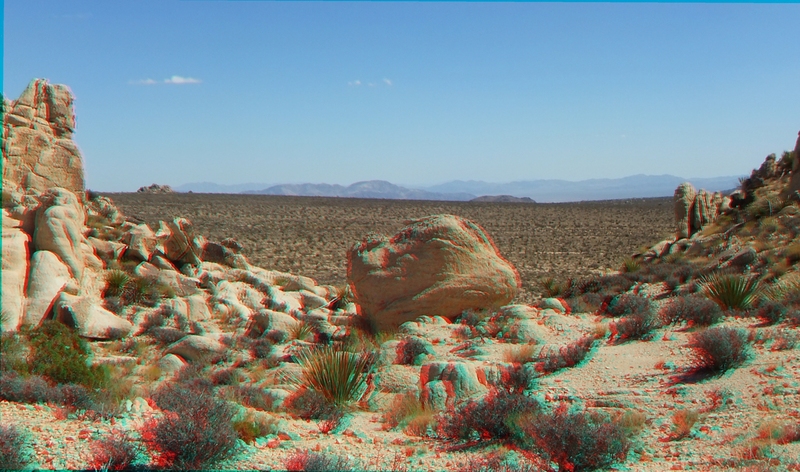 Page download speeds are improved this way. 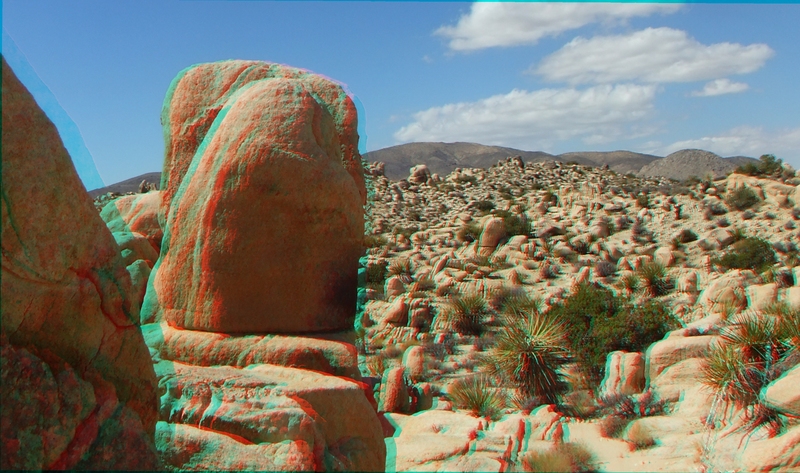 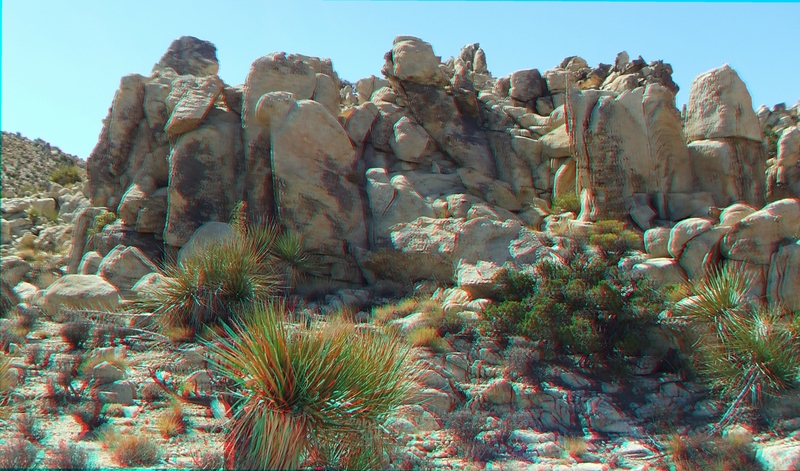 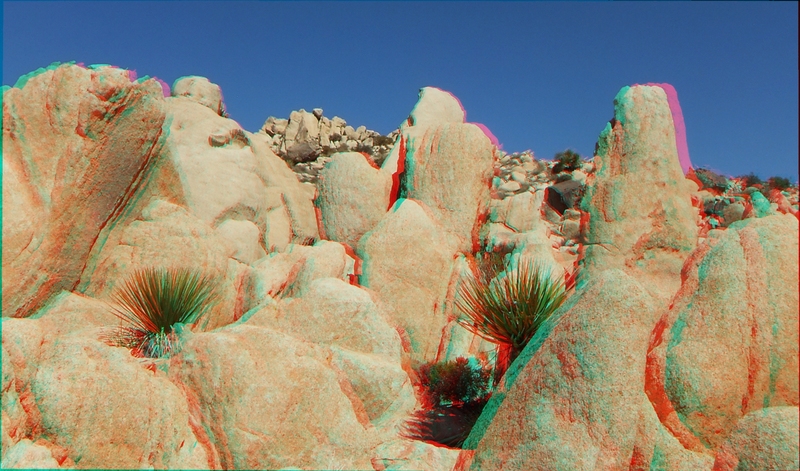 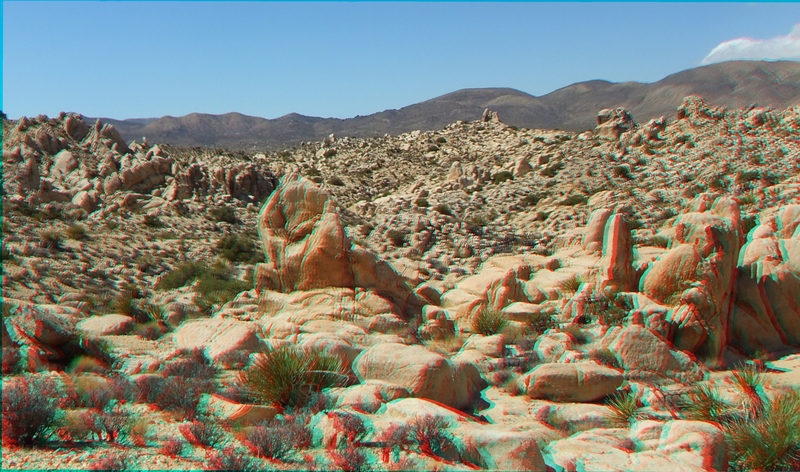 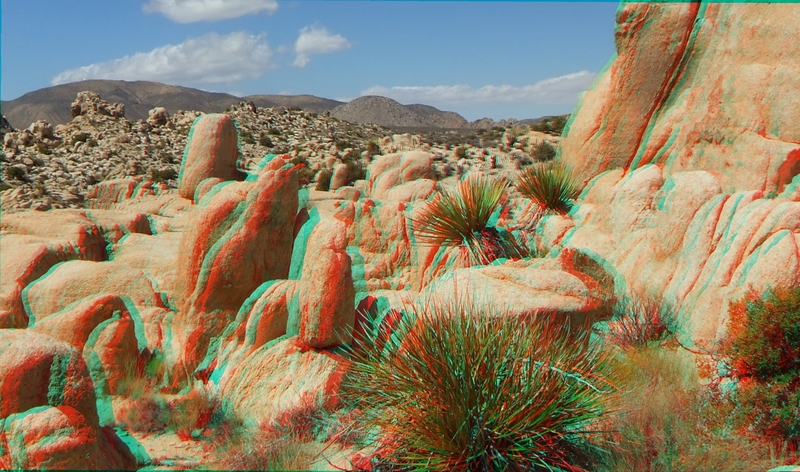 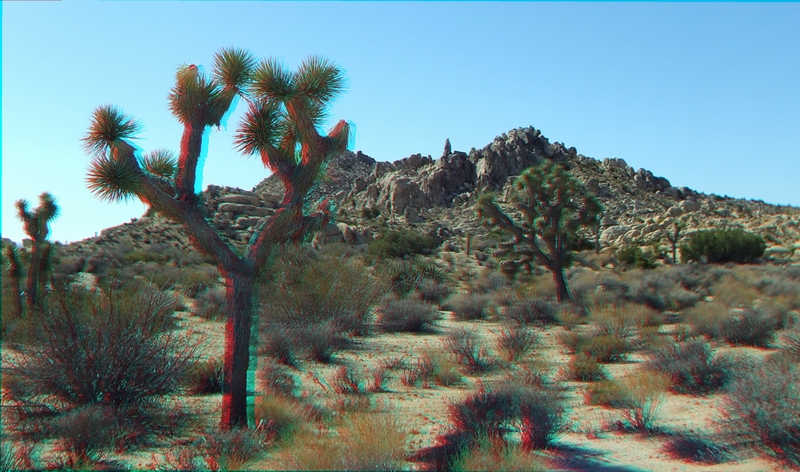 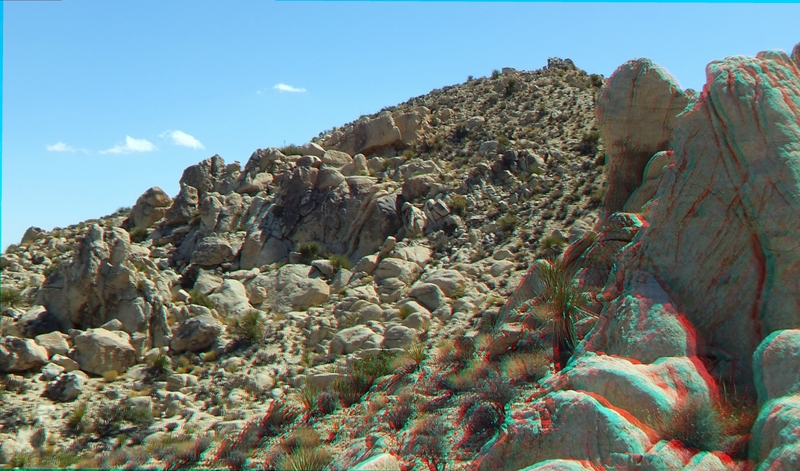 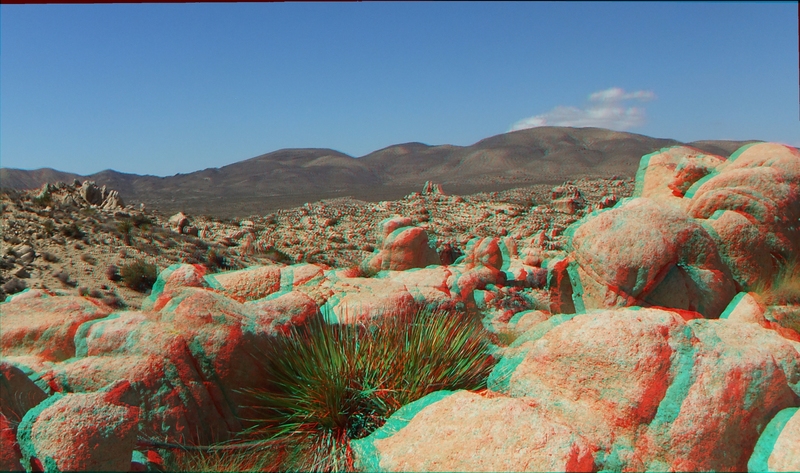 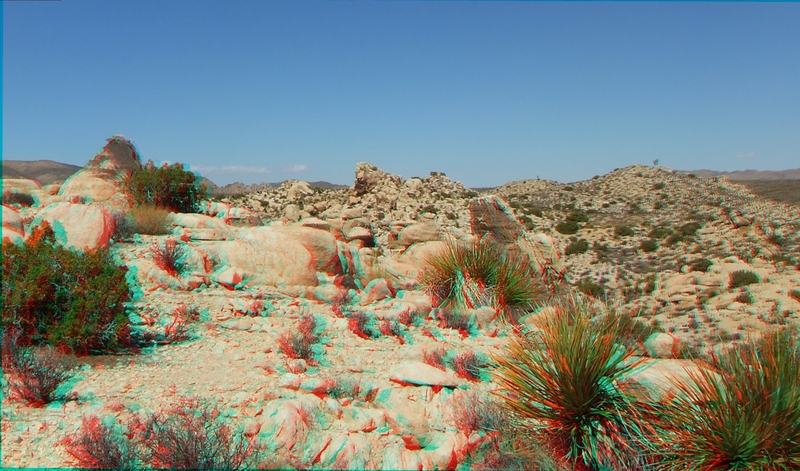 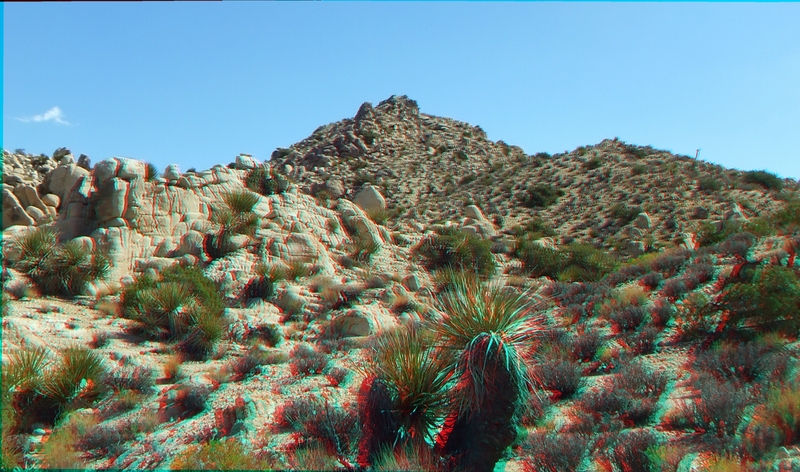 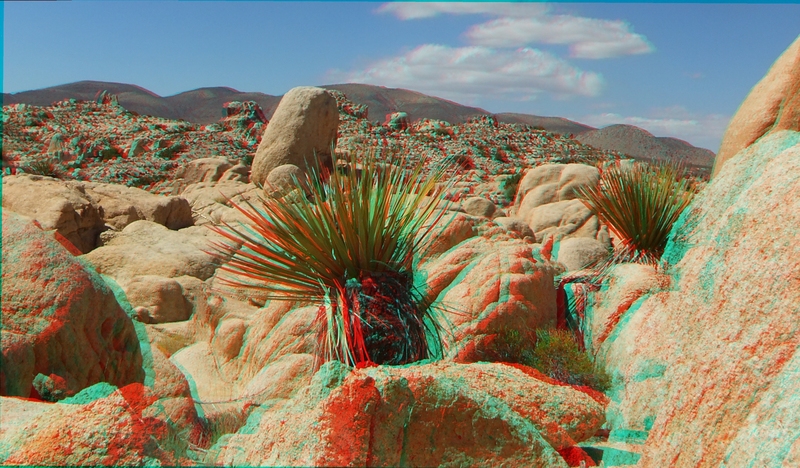 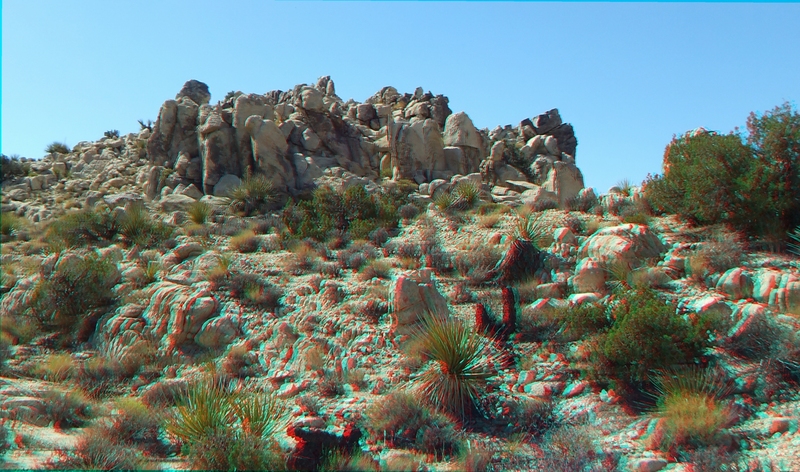 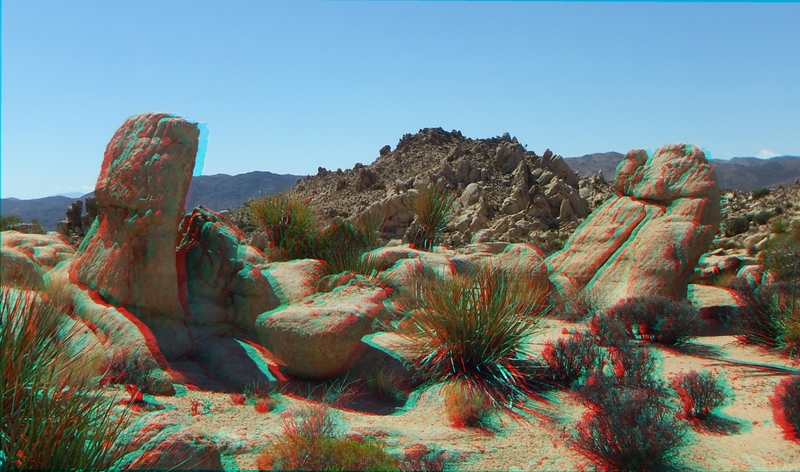 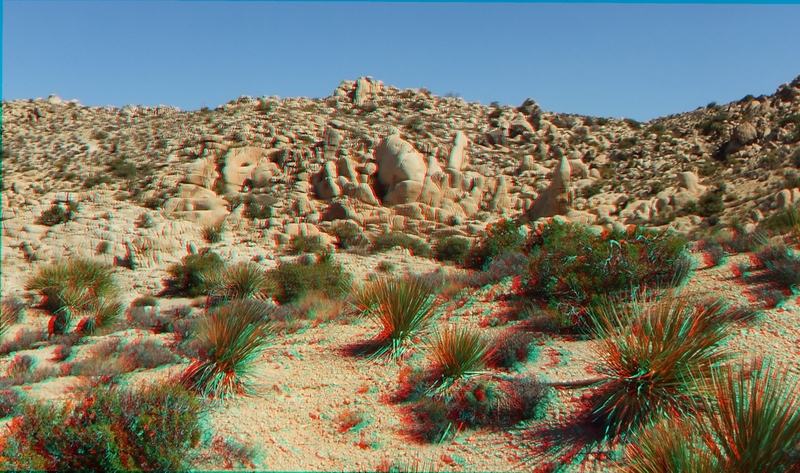 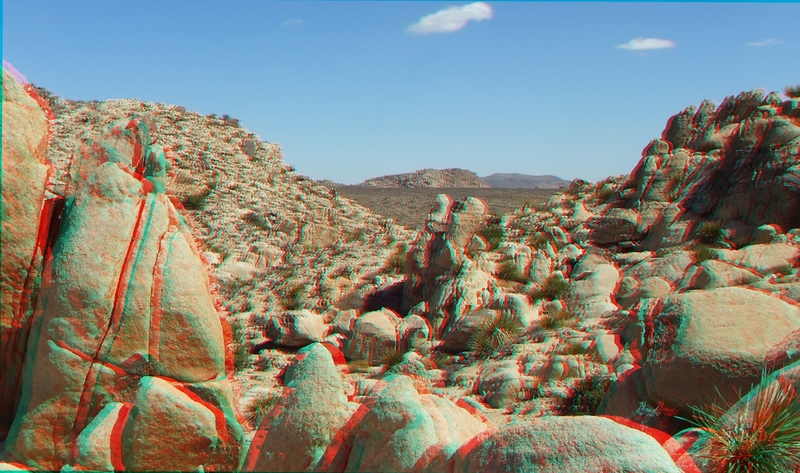 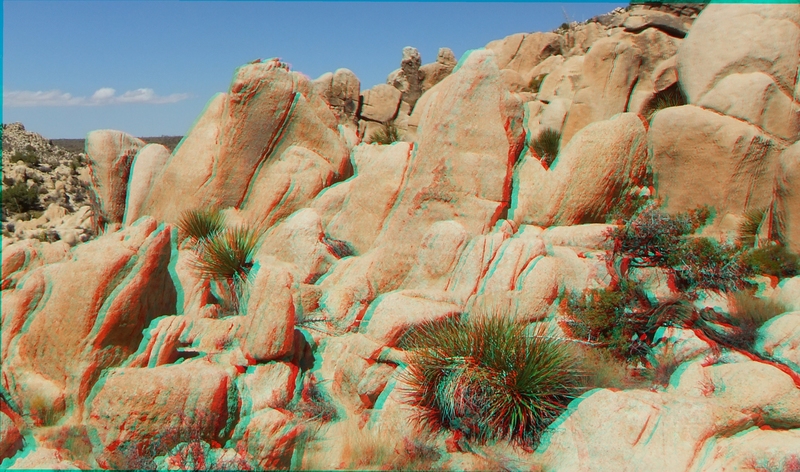 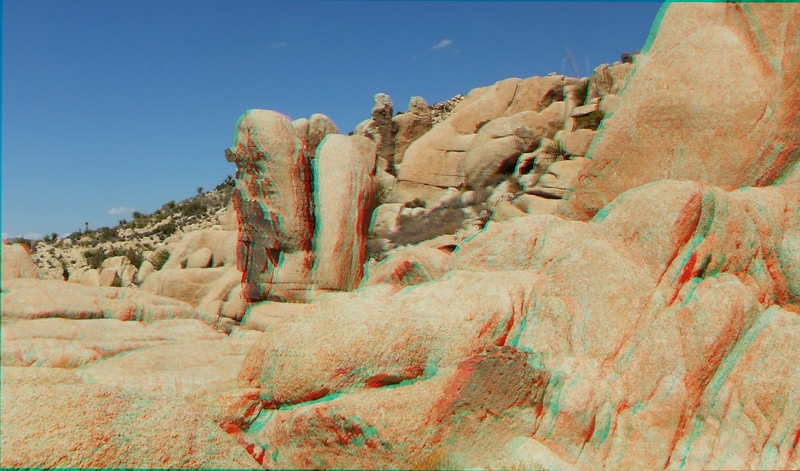 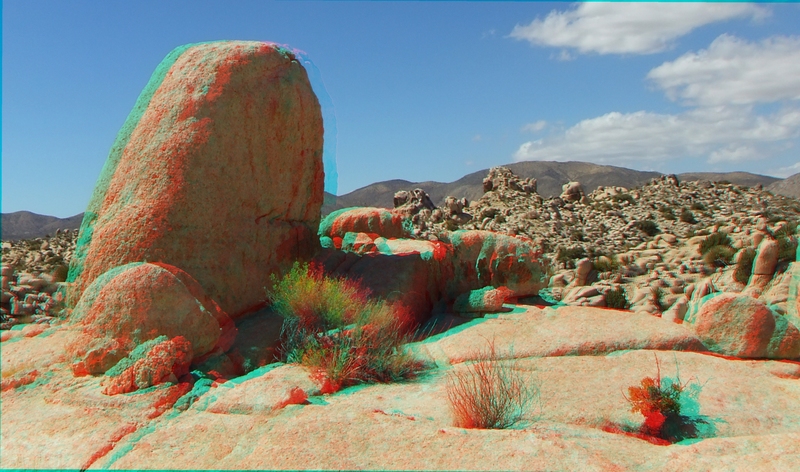 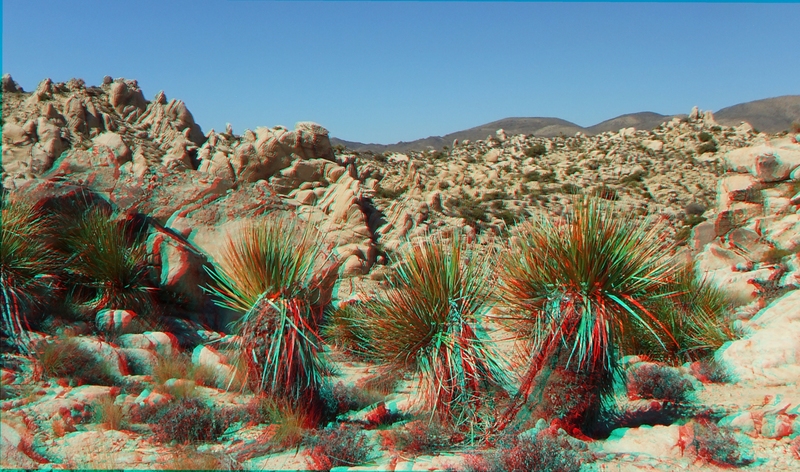 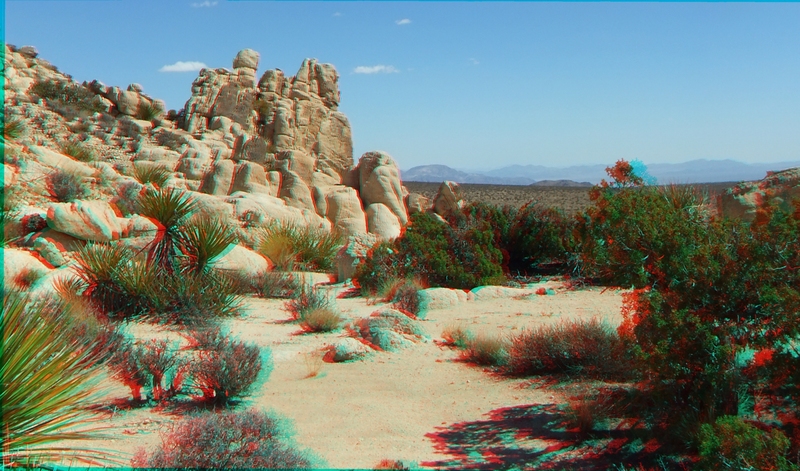 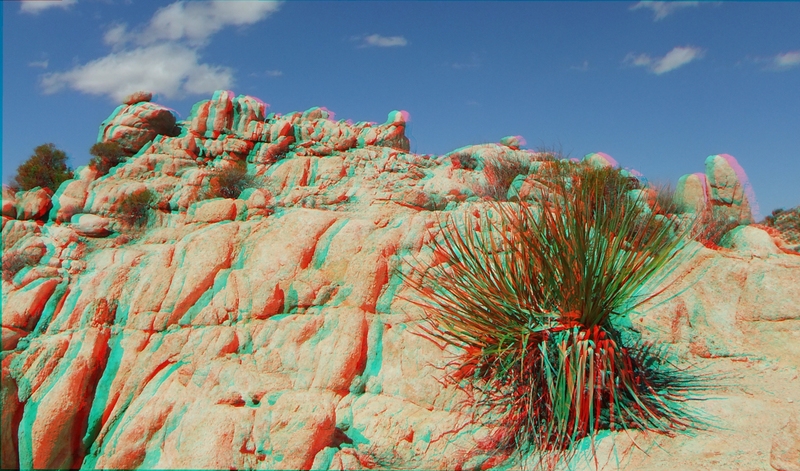 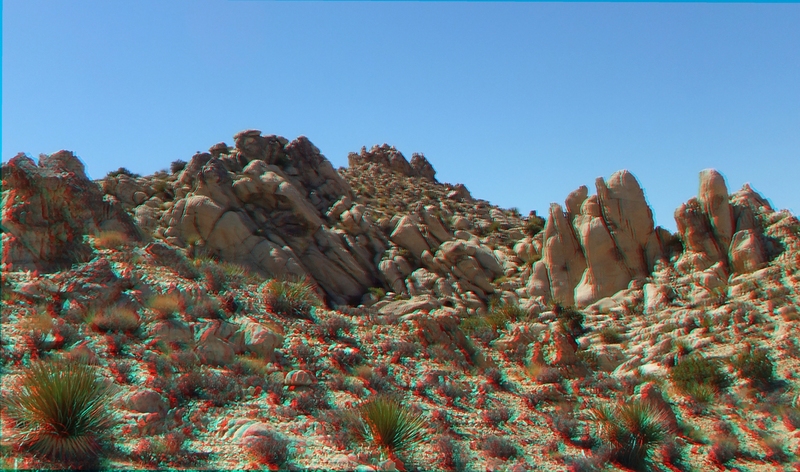 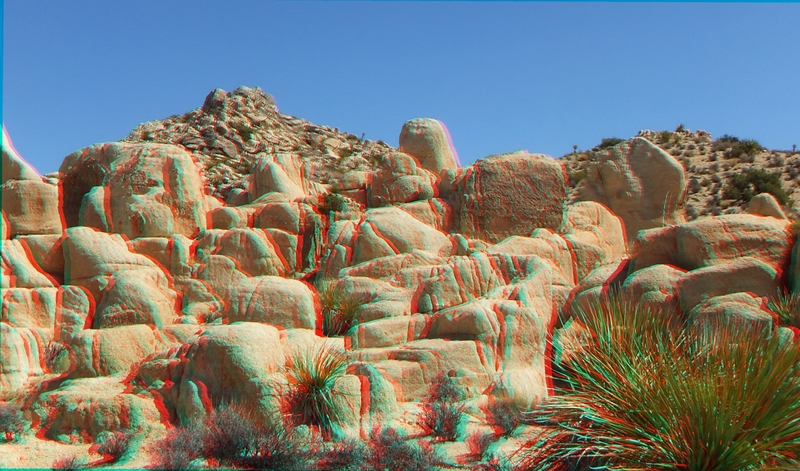 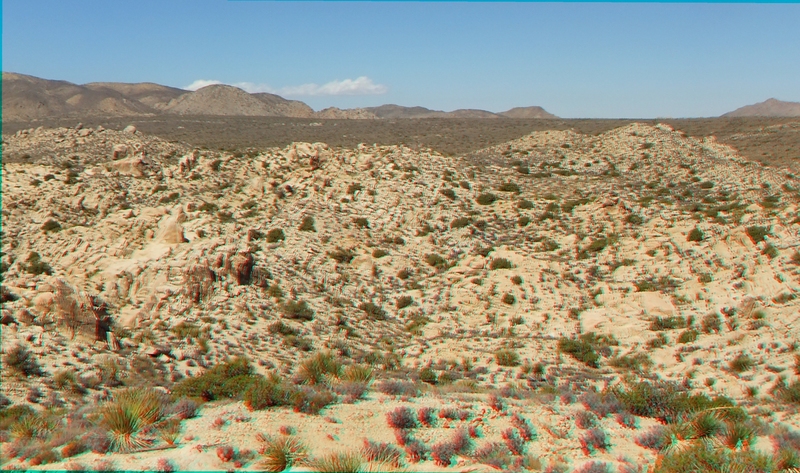 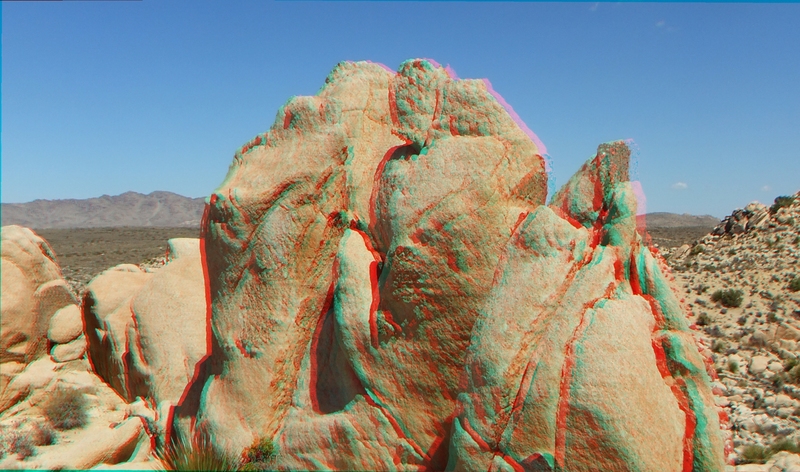 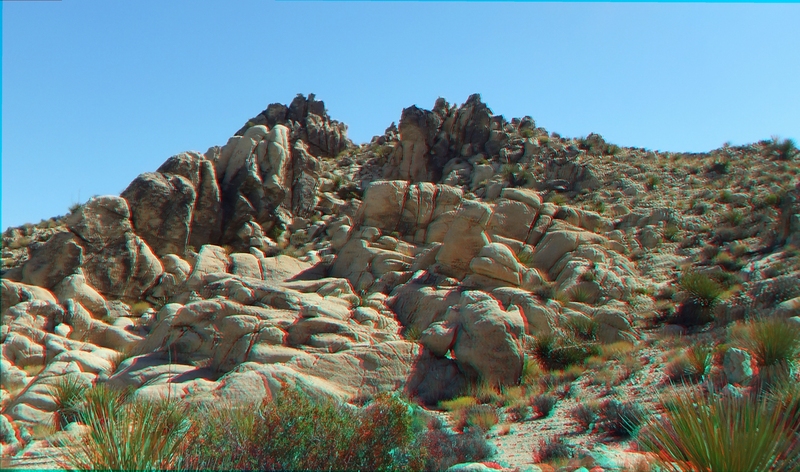 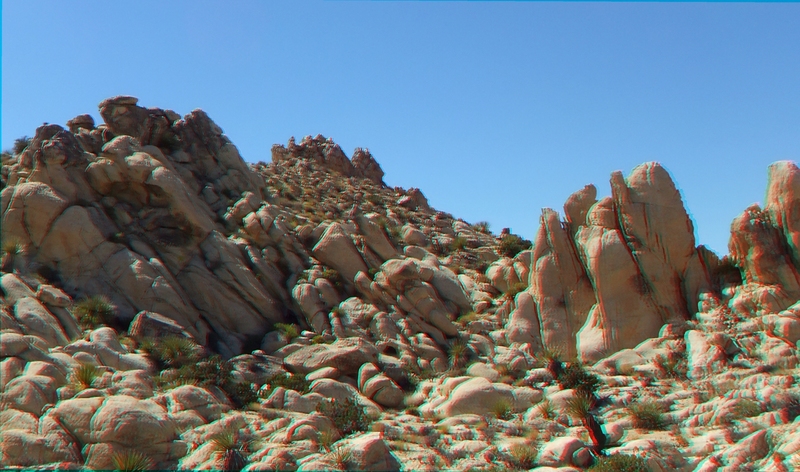 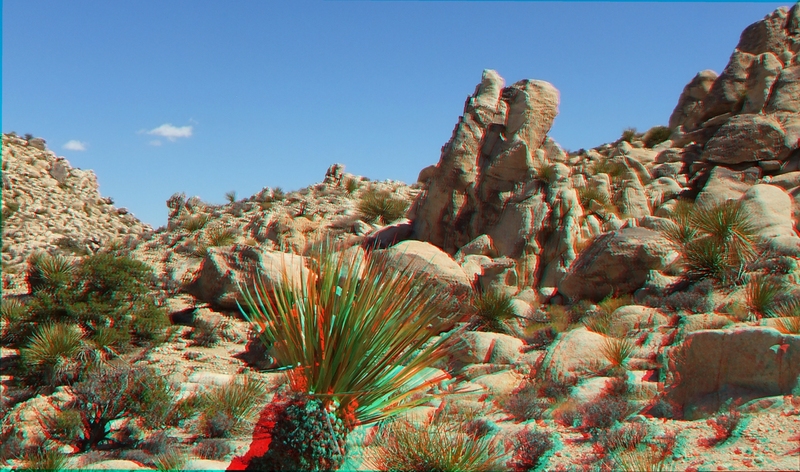 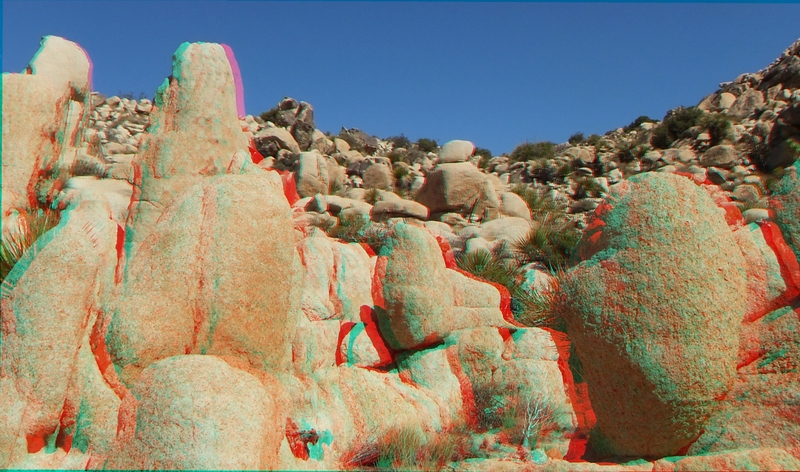 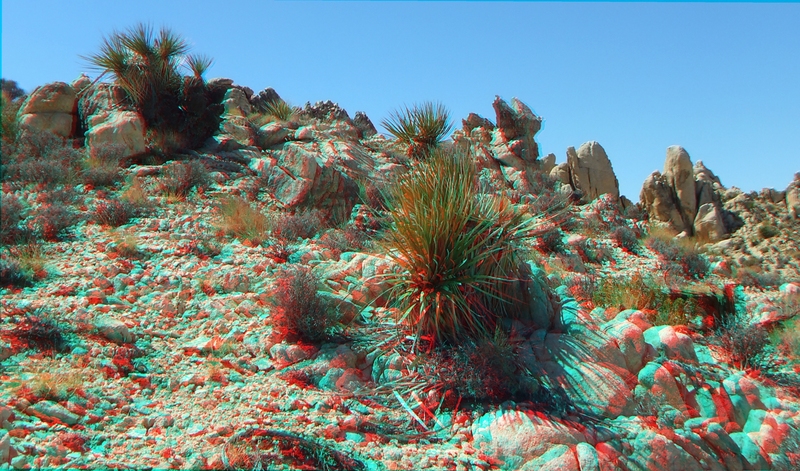 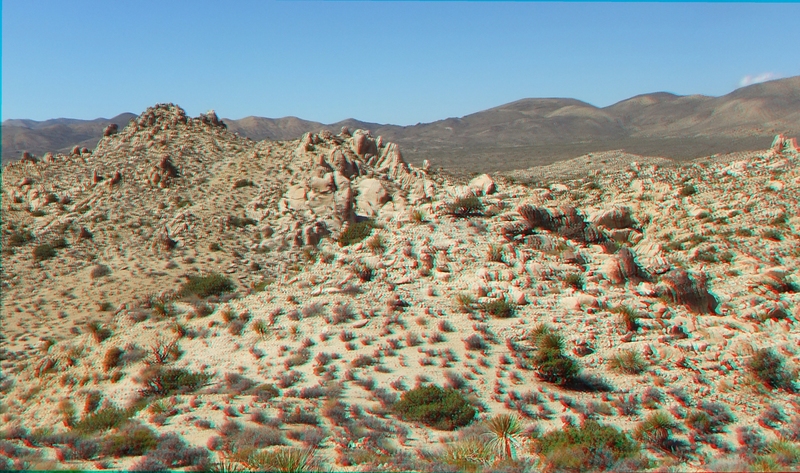 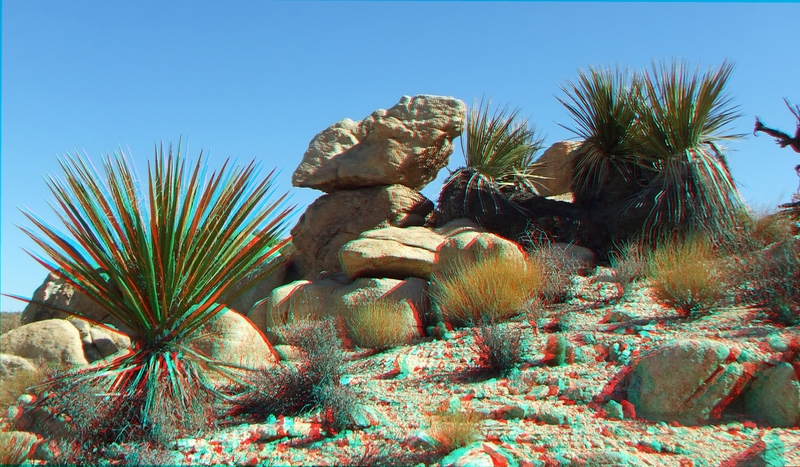 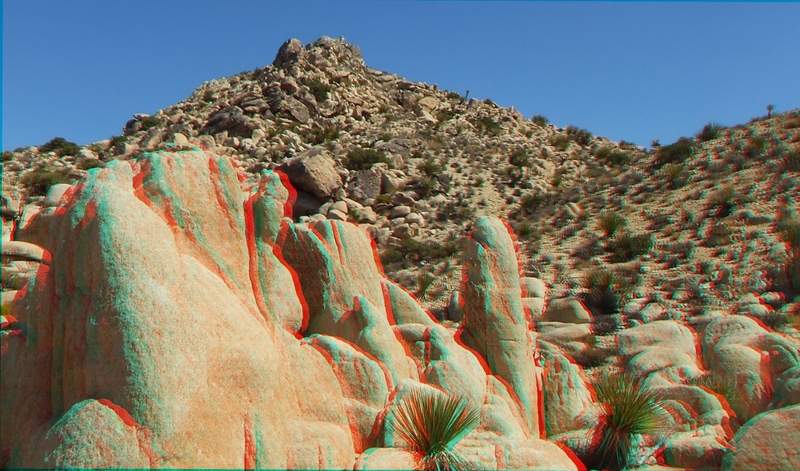 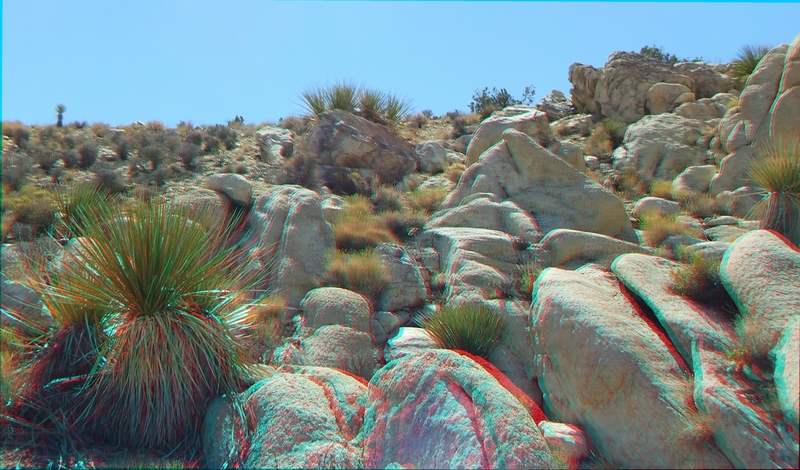 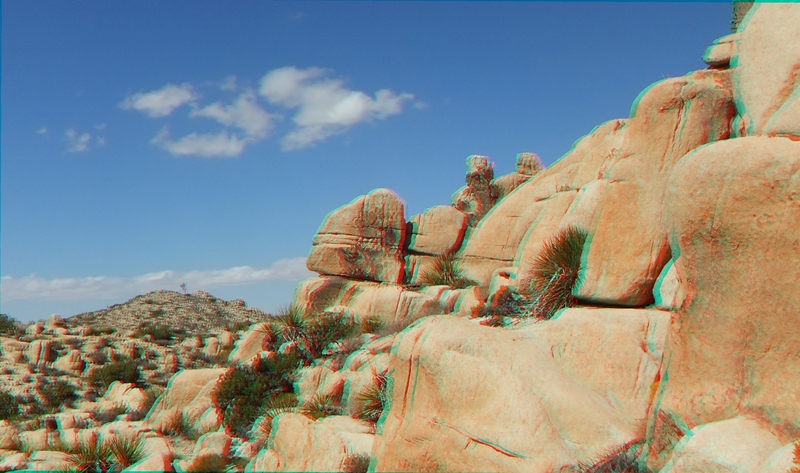 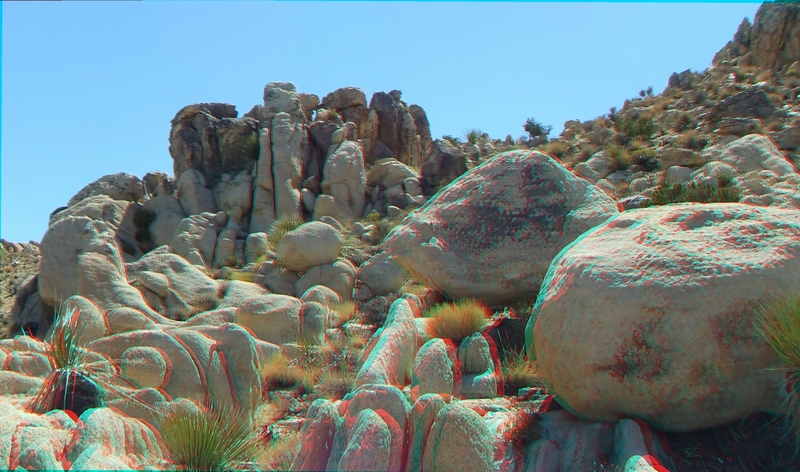 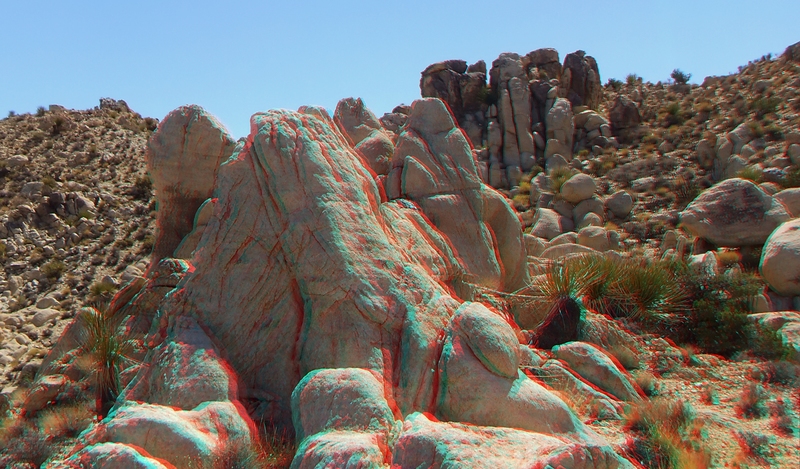 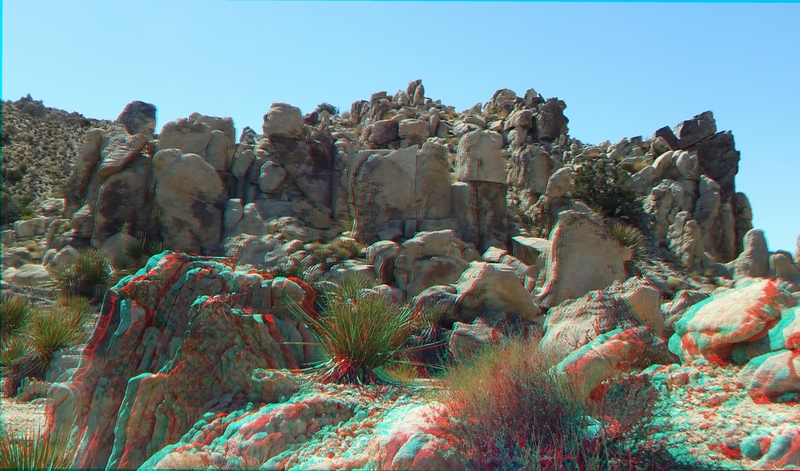 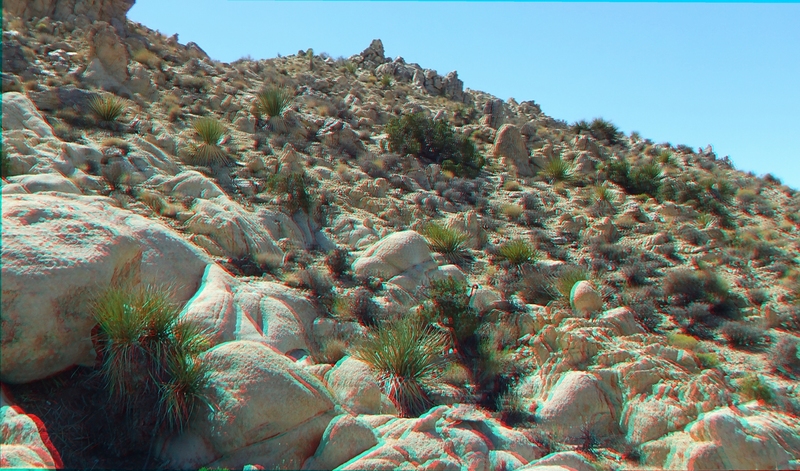 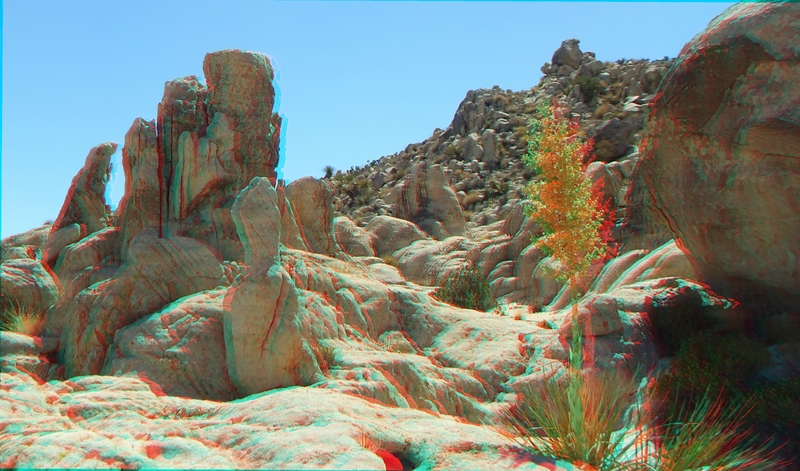 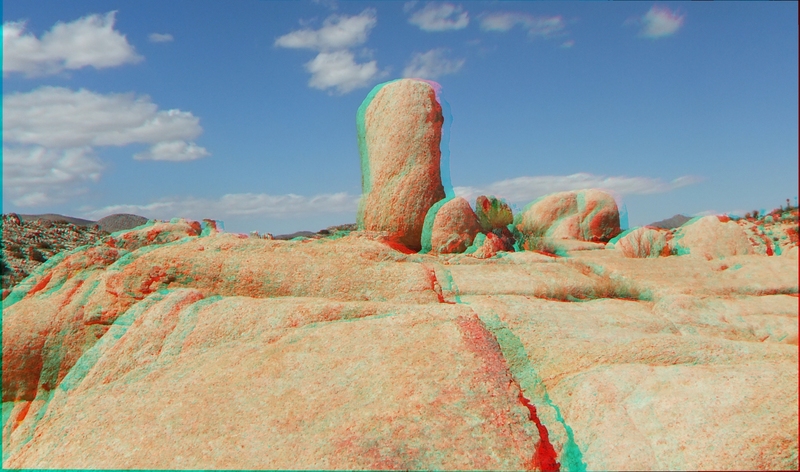 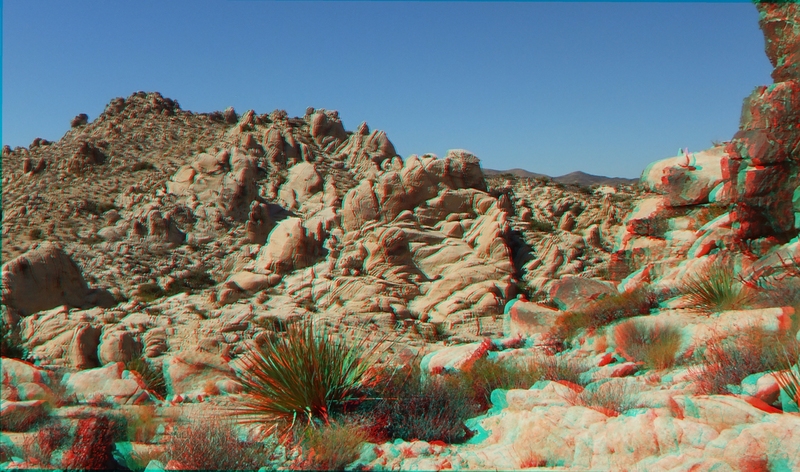 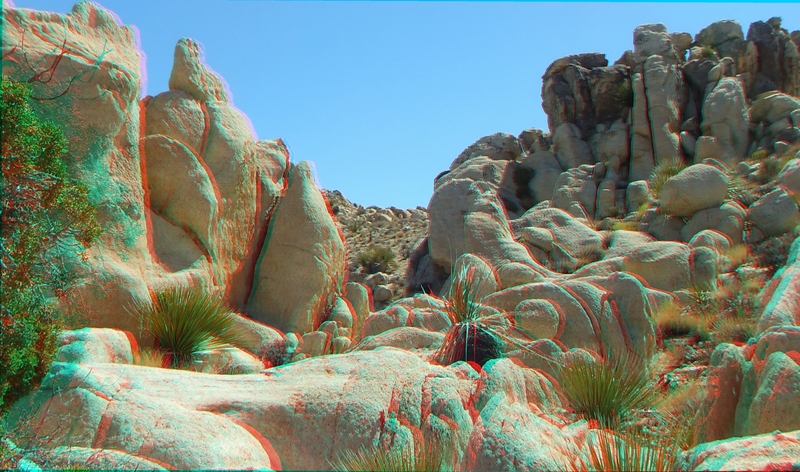 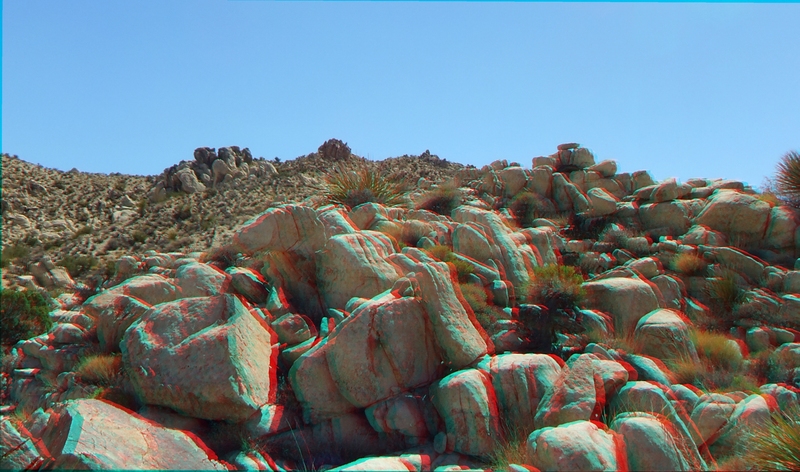 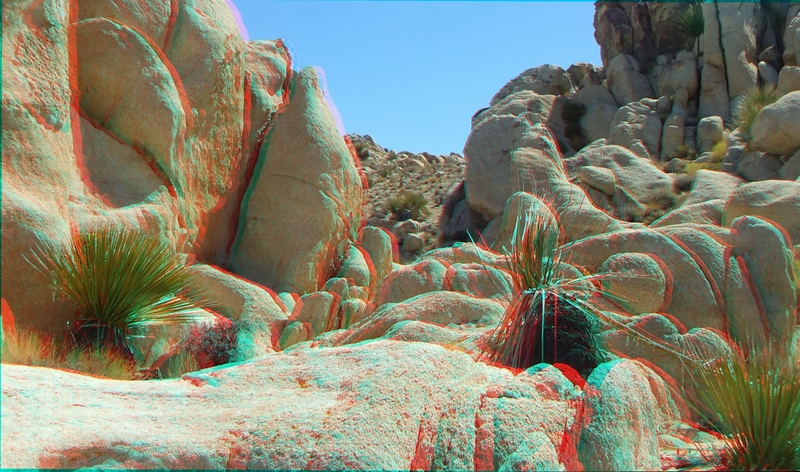 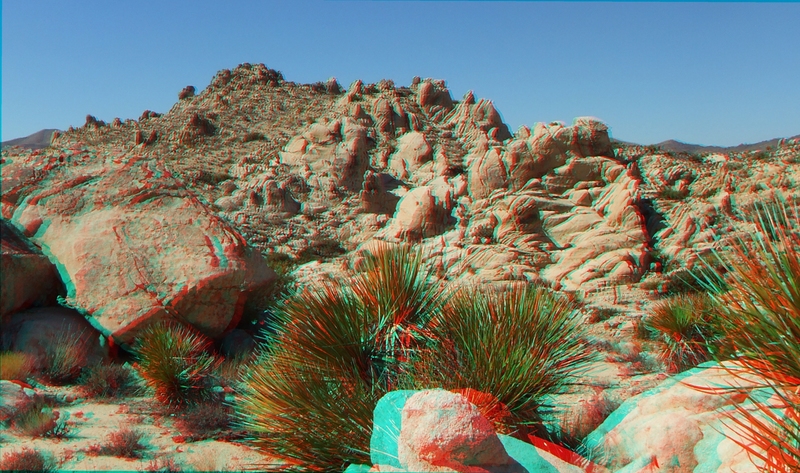 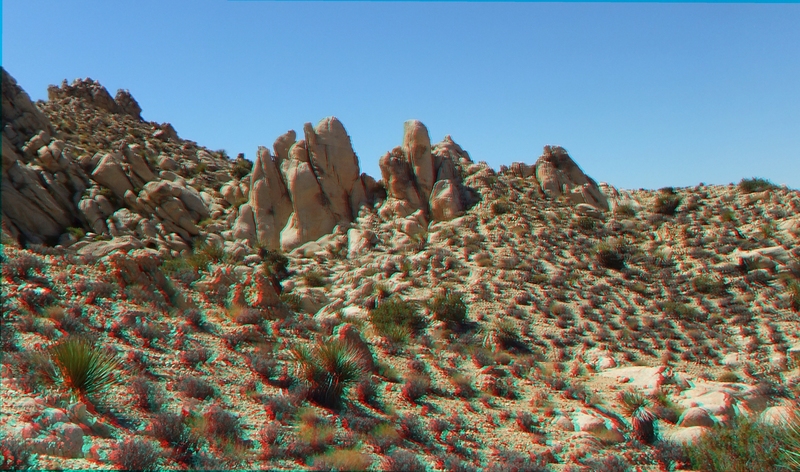 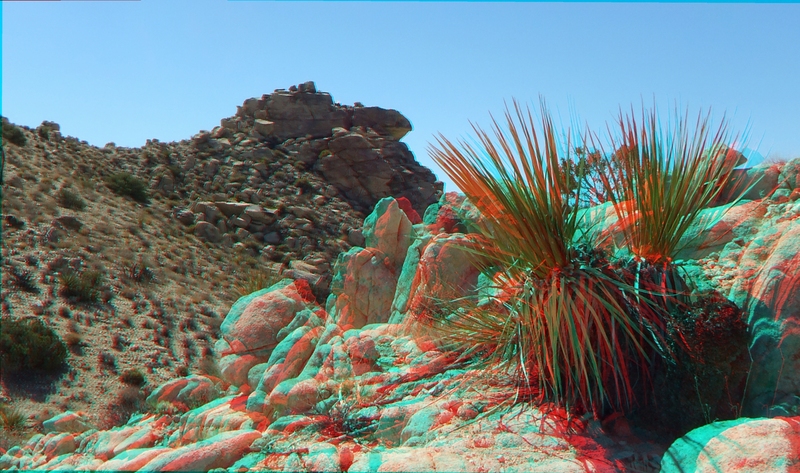 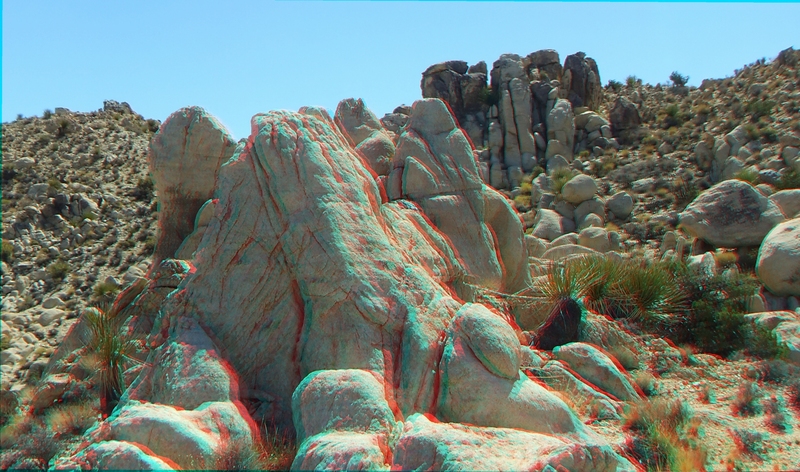 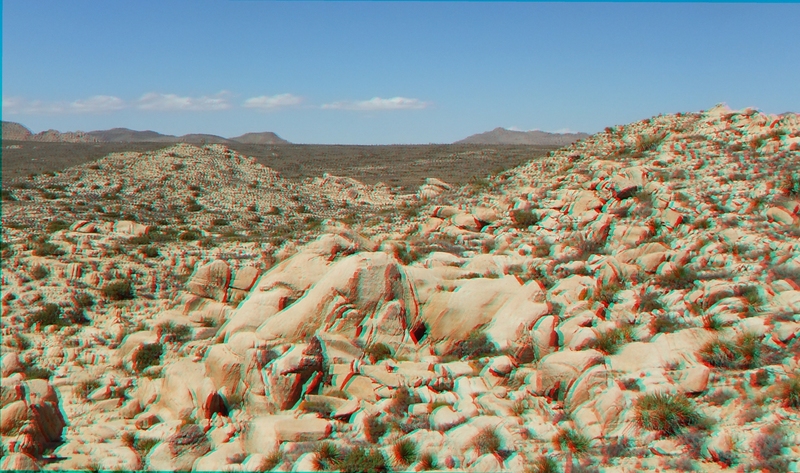 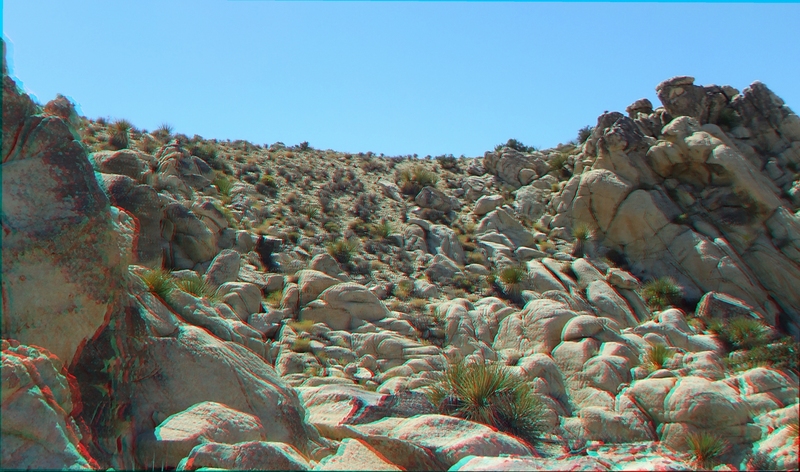 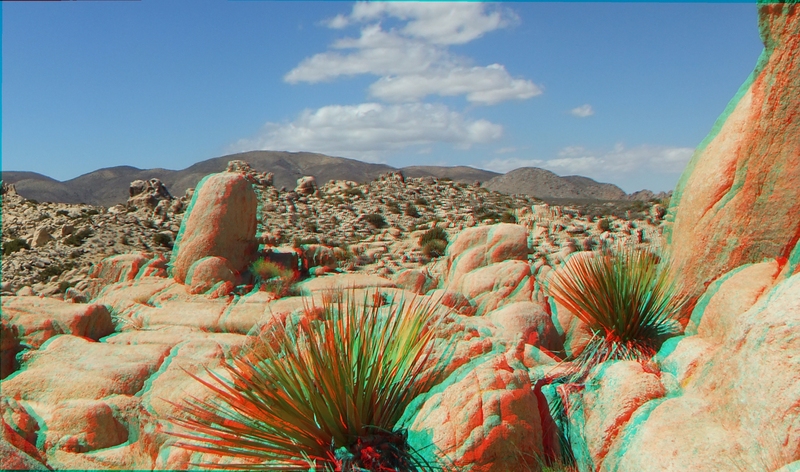 Thank you once more for participating in Joshua Tree 3D. 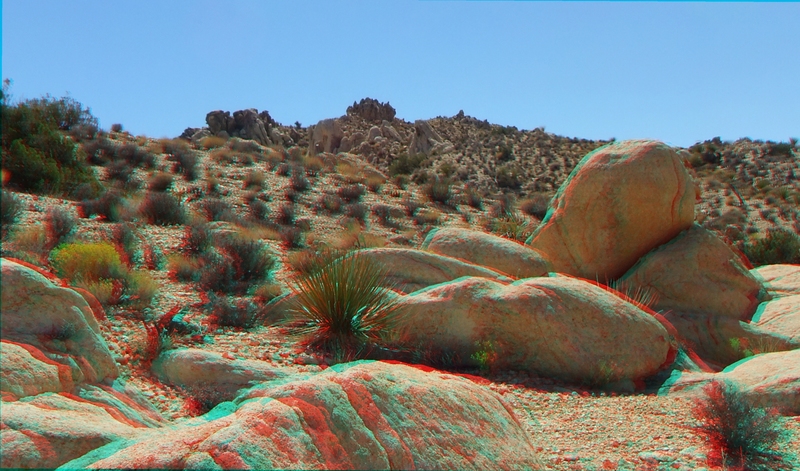 I hope you found something new and interesting to view at Towers of Uncertainty Hills with your funny red & cyan glasses …besides Youtube videos — The Management.